무선 네트워크에서 브로드캐스트/멀티캐스트 데이터를 전송하기 위한 방법, 장치 및 컴퓨터 프로그램 제품이 제공된다. A method for transmitting broadcast / multicast data in a wireless network, there is provided a device and a computer program product. 네트워크는 복수의 다중-라디오 노드들, 또는 복수의 단일-라디오 노드들, 또는 다중-라디오 및 단일-라디오 노드들의 혼합을 포함하며, 네트워크는 컨트롤 채널 및 적어도 하나의 데이터 채널을 포함한다. The network comprises a plurality of multi-radio node, or a plurality of single-radio nodes, or a multi-radio and single-comprising a mixture of a radio node, the network includes a control channel and at least one data channel. 브로드캐스트/멀티캐스트 데이터의 전송은 컨트롤 채널 또는 데이터 채널에서 발생한다. Broadcast / multicast transmission of the data occurs in the control channel or the data channel. 본 출원은 2005년 7월 29일자로 출원된 미국 가특허출원 제60/703,442 및 2005년 8월 3일자로 출원된 미국 가특허출원 제60/704,904의 이익을 갖는, 2006년 7월 28일자로 출원된 미국 특허 출원 번호 제11/494,836의 일부계속출원(CIP)이다. This application is the US, filed July 29, 2005 patent with No. 60 / 703,442, and in August 2005, filed February 3 the United States has a patent interest of No. 60 / 704,904, July 28, 2006 the application part of U.S. Patent Application Serial No. 11/494 836 is still pending (CIP). 무선랜(WLAN)들에 대한 요구의 증가는 더 높은 작업처리량을 제공하기 위한 새로운 기술의 개발을 추진하도록 하고 있다. Increase in demands on wireless local area network (WLAN) has been to promote the development of new technologies for providing a higher throughput. 이러한 성장은, 넓게는, 무선 전송을 원하는 사용자들 및 애플리케이션들의 증가로 인한 것이며, 좁게는, 두 지점들 간의 단일 연결을 따른 높은 전송율들을 요구하는 새로운 애플리케이션들의 등장으로 인한 것이다. This growth is, broadly, is due to the increase of the wireless transmission you want users and applications, narrowing is due to the emergence of new applications that require high transfer rate of a single connection between two points. 전자는 더 높은 전체 작업처리량을 요구한다. The former requires a higher overall throughput. 후자는 증가된 링크 작업처리량을 요구한다. The latter requires an increased link throughput. 본 출원은 다중 채널들에 동시 전송을 가능하게 함으로써, 무선 네트워크(즉, 무선랜 또는 무선 메시 네트워크)의 증가하는 전체 작업처리량을 위한 MAC-기반 접근들에 관한 것으로, 특히 브로드캐스트 및 멀티캐스트 데이터가 전송될 수 있는 방법에 관한 것이다. The present application relates to a MAC- based access for the entire throughput to increase by allowing the simultaneous transmission on multiple channels, the wireless network (i.e., a wireless LAN or wireless mesh networks), in particular broadcast and multicast data It relates to a method that can be sent. MAC 프로토콜은 두 개의 로지컬 채널 기능들, 컨트롤 채널(CC) 및 데이터 채 널(DC) 간을 구별한다. MAC protocol distinguishes between two logical channel functions, the control channel (CC) and data channels (DC) between. 스테이션들은 컨트롤 채널의 컨트롤 및 관리 프레임들을 교환한다. Station must exchange control and management frames on the control channel. 데이터 채널들은 데이터 트래픽(traffic)을 전송한다. Data channels and transmits the data traffic (traffic). 다양한 데이터 채널들에서의 전송을 위한 예약들(reservations)은 컨트롤 채널의 컨트롤 프레임들을 교환함으로써 이루어진다. Reservations (reservations) for transmission in the various data channels are made by exchanging control frames on the control channel. 이러한 컨트롤 채널은 데이터 채널(들)의 시간 예약들 및 확인 응답(acknowledgment)을 위한 각 노드에 의해 이용된다. This control channel is used by each node for the time reservation and acknowledgment (acknowledgment) of the data channel (s). 컨트롤 채널은 다이나믹하게(빠르게) 변화되지 않는다. The control channel is not changed dynamically (faster). 데이터 채널(들)은 데이터 트래픽을 전송하기 위한 노드들에 의해 이용되는 채널들이다. Data channel (s) are the channels used by the node for transmitting data traffic. 각 노드는 항상 동일한 데이터 채널(들)에서 전송할 수 있고, 또는 요구에 따라 전송할 채널을 선택할 수도 있다(다이나믹 채널 할당). Each node always be able to transmit data in the same channel (s), or may select a channel to transmit on demand (dynamic channel allocation). 레거시(legacy) RTC 및 CTS 메시지들의 확장들로서, CC-RTS 및 CC-CTS가 TXOP(Transmission Opportunity)를 전송하기 위해 걸리는 시간 동안 데이터 채널을 예약하기 위해 이용된다. While as expansion of the legacy (legacy) RTC and CTS messages, the time CC-RTS and CC-CTS takes to transfer (Transmission Opportunity) TXOP is used to reserve a data channel. TXOP(transmit opportunity)는 채널에 대한 단일 경합에 수반하는 한 쌍의 노드들 간에 전송되는 프레임들의 시퀀스이다. TXOP (transmit opportunity) is a sequence of frames that are transmitted between a pair of nodes associated with contention for a single channel. 소스 노드는 TXOP를 시작하는 노드이며, 목적지 노드(Destination node)는 TXOP를 수신하는 노드이다. The source node is the node to start a TXOP, the destination node (Destination node) is a node that receives a TXOP. 데이터 트래픽은 유휴상태(idle)인 데이터 채널에만 전송될 수 있다. Traffic data may be sent to only the data channel is idle (idle). TXOP의 전송을 위해 선택된 특정 데이터 채널은 CC-RTS/CC-CTS의 특정 필드에 나타난다. Particular data channel selected for transmission of the TXOP is shown in the specific field of the CC-RTS / CC-CTS. CC-RTS 프레임은 TXOP를 시작하는 노드에 의해 이용되는 프레임이다. CC-RTS frame is a frame to be used by the node to start a TXOP. CC-CTS 프레임은 TXOP를 수용하는 노드에 의해 이용된다. CC-CTS frame is used by a node for receiving a TXOP. 만약, 전송의 수신의 확인 응답을 원하면, 데이터 채널 또는 컨트롤 채널에 전송될 수 있다. If, if desired an acknowledgment of receipt of a transmission, it may be sent to a data channel or control channel. CC-ACK로 알려진, 컨트롤 채널의 확인 응답은 성공적으로 수신된 프레임들의 시퀀스에서 개별 프레임을 식별한다(802.11e GROUP Ack와 유사함). Known as the CC-ACK, on ​​the control channel confirmation response identifies the individual frame in a sequence of frames received successfully in (similar to the 802.11e GROUP Ack). 이웃노드(neighbor)로 전송하기 위한 프레임들에 관한 노드는 허용 가능한 데이터 채널로 전송하기 위해 그 데이터 라디오(data radio)를 세팅하고, 컨트롤 채널의 CC-RTS를 목적지 노드로 송신하며, 선택/할당된 데이터 채널에 대한 채널 예약 요청의 수용 또는 거절을 포함하는 CC-CTS를 기다린다. Node of the frames for transmission to the neighboring node (neighbor) is to transmit to the acceptable data channel setting the data radios (data radio), and sends a CC-RTS of the control channel to a destination node, the selection / allocation wait a CC-CTS, including the acceptance or rejection of the channel reservation request for the data channel. 만약, 목적지 노드가 CC-RTS를 수신하면, 그것은 CC-CTS를 전송한다. If, when the destination node receives a CC-RTS, it transmits a CC-CTS. 만약, 목적지 노드가 CC-RTS에서의 예약 요청을 수용하지 않으면, CC-CTS는 예약 지속 기간 필드(Reservation Duration field)에 0을 포함할 것이다. If, if the destination node does not accept booking requests from CC-RTS, CC-CTS will contain a zero to the reservation duration field (Reservation Duration field). 만약, 예약 지속 기간 필드 또는 프레임들의 수 필드(Number of Frames field)가 CC-CTS에 0을 포함한다면, CC-CTS는 전송되지 않는다. If the number of fields or frames of the Reservation duration field (Number of Frames field) that contains zero if the CC-CTS, CC-CTS is not transmitted. 만약, 목적지 노드가 CC-RTS에서의 예약 요청을 수용한다면, 목적지 노드는 소스 노드에 의해 할당/선택된 데이터 채널에서 수신하도록 데이터 라디오를 설정한다. If, If the destination node accepts the reservation request on the CC-RTS, the destination node to set the radio to receive data from the allocated / selected data channel by the source node. 만약, 목적지 노드가 SIFS에 전송 시간(tx time)을 더한 시간에 동일한 CC-CTS를 수신한다면, 그것은 또 다른 CC-CTS를 전송하고, SIFS 에 CC-CTS 전송기간을 더한 것과 동일한 시간 간격을 기다린다. If, if receiving the same CC-CTS to the time that the destination node, plus the transfer time (tx time) to SIFS, it further transmits a CC-CTS, and waits for the same time interval as CC-CTS plus the transfer period in SIFS . 만약, CC-CTS가 SIFS, CC-RTS 전송기간, 및 CC-CTS 전송기간을 더한 것의 만료까지 소스 노드에 도착하지 않으면, 그것은 컨트롤 채널로 또 다른 CC-RTS를 SIFS 내에 전송한다. If If CC-CTS is to expire things, plus SIFS, CC-RTS transmission period, and the CC-CTS transmission period to arrive at the source node, it sends a CC-RTS with another control channel within a SIFS. 만약, CC-CTS가 SIFS, CC-RTS 전송기간 및 CC-CTS 전송기간을 더한 시간을 포함하는 시간 간격 내에 소스 노드에 의해 수신되고, 예약 지속 기간 필드가 0 값을 가지면, 소스 노드는 예약 지속 기간 필드가 0으로 세팅된 목적지 노드에 CC- RTS를 전송한다. If, the CC-CTS is received by the source node within the time interval containing the SIFS, the time CC-RTS plus the transmission period and the CC-CTS transmission time period, the reservation duration of the field has the value of zero, the source node reservation duration in which the duration field set to zero, the destination node transmits the CC- RTS. 만약, CC-CTS가 SIFS, CC-RTS 전송기간, 및 CC-CTS 전송기간을 더한 시간과 동일한 시간 간격 내에서 소스 노드에 의해 수신되고, 예약 지속 기간 필드가 더 긴 값으로 변경되면, 소스 노드는 예약 지속 기간 필드가 0으로 세팅된 목적지 노드에 CC-RTS를 전송한다. If, when a CC-CTS is SIFS, CC-RTS transmit time period, and the CC-CTS is received by the source in the same time interval and the time obtained by adding the transmission duration node, the Reservation Duration field is changed to a longer value, the source node sends a CC-RTS with a reservation duration field set to 0 to the destination node. 만약, CC-CTS가 소스 코드에 SIFS, CC-RTS 전송기간, 및 CC-CTS 전송기간을 더한 시간과 동일한 시간 간격 내에 도착하고, 예약 지속 기간 필드가 0이 아닌 값을 가지면, 소스 노드는 TXOP의 프레임(들)을 전송한다. If, CC-CTS to arrive in the same time interval and the time obtained by adding the SIFS, CC-RTS transmit time period, and the CC-CTS transmission time period in the source code, and the reservation duration field has a value other than zero, the source node TXOP a transmits the frame (s). CC-RTS/CC-CTS 교환은 동일시간 간격 동안, 다중 데이터 채널들, 또는 컨트롤 채널 및 하나 이상의 데이터 채널들을 예약할 수 있도록 정의될 수 있다. CC-RTS / CC-CTS exchange can be defined to be scheduled for the same time period, multiple data channels or control channels and one data channel. CCC 프로토콜은 다수의 채널이 두 개의 노드 간의 통신을 위해 즉시 예약될 수 있도록 확장될 수 있다. CCC protocol has a number of channels can be expanded so that it can be immediately reserved for the communication between the two nodes. 예를 들어, 전송 노드는 전송 데이터를 위해 데이터 채널 및 컨트롤 채널을 예약할 수 있다. For example, the transmitting node may schedule a data channel and a control channel for data transmission. 데이터는 동시에 목적지 노드로 전송되도록 두 개의 스트림으로 분리될 수 있다. The data may be split into two streams to be simultaneously transmitted to the destination node. 이것은 두 노드 간의 데이터율을 두 배로 할 것이다. This will be the data rate between the two nodes doubled. 이 시나리오에서, 노드는 두 개의 라디오를 필요로 한다. In this scenario, the node requires two radios. 대안적으로, 두 개의 채널이 전송 노드로 즉시 예약될 수도 있다. Alternatively, the two channels may be scheduled as soon as the sending node. 두 개의 채널은 인접할 수 있고, 단일의 폭넓은 대역폭 라디오가 전송 및 수신에 이용될 것이다. Two channels may be adjacent to each other, it would be a single wide bandwidth used for transmission and reception of the radio. 만약, 두 개의 채널이 인접하지 않다면, 두 개의 독립된 데이터 라디오가 데이터의 일부로서 서로 전송할 것이다. If two channels are adjacent if not, it will send to each other as two separate data portion of the radio data. 두 개의 다중-채널 MAC 프로토콜이 검토된다. Two multi-channel MAC protocol is reviewed. 하나의 프로토콜은 디바이스마다 적어도 두 개의 라디오를 필요로 한다. One protocol requires at least two radios each device. 하나의 라디오는 '컨트롤 라디 오(control radio)'로서, 컨트롤 채널용으로 제공되고, 나머지 라디오들은 '데이터 라디오들(data radios)'로서, 데이터 채널들에 튜닝된다. A radio is provided for, as a control channel, radio control (radio control) ", the remaining radios as" data radios (data radios) ", is tuned to the data channel. 컨트롤 라디오가 컨트롤 및 데이터 트래픽에 사용될 수 있는 반면, 단지 데이터 트래픽만이 데이터 라디오(들)를 통해 전송될 수 있다. While the radio controls that can be used for control and data traffic, the only data traffic can be transmitted via data radio (s). 우리는 이 프로토콜을 가리켜 "다중-라디오 프로토콜(multi-radio protocol)'이라 부른다. 다중-라디오 프로토콜을 적용하는 무선 네트워크에서의 노드들은 '다중-라디오 노드들(multi-radio nodes)'로 불린다. We have a protocol point to the "multi -" is called multi - node in the wireless network to apply the radio protocols, radio protocols (multi-radio protocol) multi-called radio nodes (multi-radio nodes) '. 두번째 프로토콜은 전용 컨트롤 라디오를 갖기 위한 노드를 필요로 하지 않는다. The second protocol does not require a control node to have a dedicated radio. 동일한 라디오가 컨트롤 및 데이터 채널들 간에 스위칭된다. The same radio is switched between the control and data channels. 단일-라디오 프로토콜을 적용하는 무선 네트워크에서의 노드들은 '단일-라디오 노드들(single-radio nodes)'로 불린다. A single-node in the wireless network, the application of radio protocols - referred to as "single radio node (single-radio nodes) '. 단일-라디오 및 다중-라디오 노드들 모두가 무선 네트워크를 포함할 때, '혼합된 네트워크(mixed network)'로 불리고, 그 개시내용이 전체로서 참조되어 통합된, 2006년 7월 26일자로 출원된 함께 공동-계류중인 특허 출원 대리인 문서번호 AVA06-36에 기술된 바와 같이, 두 가지 유형들의 노드들의 공존을 허용하기 위해 추가적인 측정들이 이루어진다. Filed with the radio nodes when both include a wireless network, the 'mixed network (mixed network)' referred to, the disclosure of which is referred to as full integration, July 26, 2006 Date - single-radio and multi with co-as described in Patent Application attorney Docket No. AVA06-36 pending, additional measurements are made to allow for co-existence of the nodes of two types. 다중-라디오 프로토콜에 대해, 각 노드는 혼잡들을 피하기 위해 채널-지정 NAV를 유지한다. For the radio protocol, each node channel to avoid congestion - Multi maintain a specified NAV. NAV는 컨트롤 또는 데이터 채널이 예약되는 시간의 길이를 추적한다. NAV tracks the length of time that the control or data channel reservation. NAV는 채널 상에서 전송되는 것이 반드시 금지되어야 하는 시간 주기(time period)이며, 노드가 예약 요청 또는 예약 요청에 대한 응답을 수신할 때 업데이트된다. NAV is the time period (time period) that it must be prohibited to be sent on the channel, and is updated when the node receives a response to the reservation request or reservation request. 데이터 채널의 NAV는 CC-RTS/CC-CTS의 예약 지속 기간 필드의 값에 기초한다. NAV data channel is based on the value of the Reservation Duration field in the CC-RTS / CC-CTS. 데이터 채널에서 수신된 NAV-세팅 프레임들은 데이터 채널 NAV들을 또한 업데이트한다. The NAV- setting frame received from the data channel must also update the data channel NAV. 단일-라디오 프로토콜에 대해, 컨트롤 채널 상에는 제공된 라디오가 없기 때문에, 컨트롤 및 데이터 채널들에 수신된 NAV 세팅 프레임들에 기초하여 NAV를 단독으로 유지하는 것은 불가능하다. Single-due to the radio protocol, it is not formed on the supplied radio control channel, it is not possible to solely maintain the NAV on the basis of the control, and the NAV setting frame received on the data channel. 손실된 NAV 정보를 복원하기 위해, 모든 채널들을 주기적으로 릴리즈(release)하도록 하는 요구들이 모든 채널들의 NAV를 0으로 리셋되도록 한다. To restore the missing NAV information, it needs to periodically release (release) of all channels have to be reset the NAV of all channels to zero. 동일한 이유로, 단일-라디오 및 멀티-라디오 노드들 둘 다에 의해 공유된 컨트롤 채널 및 임의의 데이터 채널들은 혼합된 네트워크에서 주기적으로 릴리즈되어야 한다. For the same reason, the single-radio and multi-radio nodes, both the control channel and a data channel shared by any are to be released periodically, in a mixed network. 본 발명은 다중-채널 프로토콜을 적용하는 무선 네트워크에서 노드들의 집합에 브로드캐스트/멀티캐스트 데이터를 전송하는 문제를 제기한다. The present invention is a multi-raises the issue of transmitting broadcast / multicast data to a set of nodes in a wireless network, the application of channel protocol. 단일 채널을 액세스하는 무선 랜(LAN)들에 관해서, 브로드캐스트 및 멀티캐스트 데이터는 단지 그 채널에 전송된다. As for the wireless LAN (LAN) to access a single channel, broadcast and multicast data it is only transmitted on the channel. 다중-채널 MAC 프로토콜 하에서, 상이한 옵션들 및 제한들이 존재한다. The multi-channel under the MAC protocol, there are different options and limited. 다중-라디오 프로토콜에 관해서, 브로드캐스트/멀티캐스트 데이터는 컨트롤 채널 및 데이터 채널 모두에 전송될 수 있다. Multi-As for the radio protocol, the broadcast / multicast data may be sent to both the control channel and a data channel. 단일-라디오 프로토콜에 관해서, 모든 노드들이 브로드캐스트/멀티캐스트 데이터를 수신할 것을 보증하기 위해 특별한 사전조치가 취해져야 한다. Single-radio protocol with respect to all nodes and special precautions must be taken to ensure that it receives the broadcast / multicast data. 본 발명의 실시예들은 무선 네트워크에서 브로드캐스트/멀티캐스트 데이터를 효율적으로 전송하기 위한 방법 및 장치를 제공하는 메커니즘들 및 기술들을 제공한다. Embodiments of the invention provide mechanisms and techniques that provide a method and apparatus for efficiently transmitting the broadcast / multicast data in a wireless network. 무선 네트워크에서 브로드캐스트/멀티캐스트 데이터를 전송하는 방법의 일 상세 실시예에서, 무선 네트워크는 복수의 다중-라디오 노드들을 포함하며, 네트워크는 컨트롤 채널 및 적어도 하나의 데이터 채널을 더 포함한다. In a wireless network in a broadcast / multi-cast one implementation details of how to transfer data such as a wireless network includes a plurality of multi-comprises a radio node, the network further including a control channel and at least one data channel. 본 방법은 각 다중-라디오 노드들의 하나의 라디오를 컨트롤 채널로 튜닝하고, 브로드캐스트/멀티캐스트 데이터를 컨트롤 채널의 복수의 노드들에 전송하는 것을 포함한다. It includes transmitting to a plurality of nodes of one of the radio tuning the radio to the control channel, a broadcast / multicast control channel data of the nodes - the method is a multi-angle. 무선 네트워크에서 브로드캐스트/멀티캐스트 데이터를 전송하는 방법의 또 다른 상세 실시예에서, 무선 네트워크는 복수의 다중-라디오 노드들을 포함하고, 네트워크는 컨트롤 채널 및 적어도 하나의 데이터 채널을 포함한다. In a wireless network in a broadcast / multi-cast embodiment further details of the method of transmitting data such as a wireless network includes a plurality of multi-includes radio node, the network includes a control channel and at least one data channel. 본 방법은 각 다중-라디오 노드들의 하나의 라디오를 컨트롤 채널로 튜닝하고, 브로드캐스트/멀티캐스트 데이터 전송을 위해 데이터 채널을 선택하며, 선택된 데이터 채널에 브로드캐스트/멀티캐스트 데이터를 전송하는 것을 포함한다. It includes tuning a radio of the radio node to the control channel, broadcast / for the multicast data transmission and select a data channel, and transmit the broadcast / multicast data to the selected data channel, the method each multiple . 무선 네트워크에서 브로드캐스트/멀티캐스트 데이터를 전송하는 방법의 또 다른 상세 실시예에서, 무선 네트워크는 컨트롤 채널 및 적어도 하나의 데이터 채널을 갖고, 복수의 노드들은 적어도 하나의 단일-라디오 노드를 포함한다. In a wireless network in a broadcast / multicast implementation another detail of the casting method of transmitting data such as a wireless network having a control channel and at least one data channel, a plurality of nodes at least one single-and a radio node. 본 방법은 네트워크의 모든 노드들에 의해, 미리 정해진 시간 동안 주기의 시작에서 단일-라디오 노드들에 의해 액세스 가능한 모든 데이터 채널들 및 컨트롤 채널을 릴리즈하는 것을 포함한다. The method by all nodes in the network, one at the beginning of the cycle for the predetermined time involves the release of all possible data channel access by the radio node and the control channel. 본 방법은 또한, 네트워크의 모든 노드들에 의해, 미리 정해진 시간 동안 주기의 시작에서 컨트롤 채널로 튜닝하고, 브로드캐스트/멀티캐스트 전송들을 더 높은 액세스 우선순위로 할당하며, 이에 따라, 유니캐스트 데이터가 주기 P의 시작에서 컨트롤 채널에 전송될 수 있기 전에 브로드캐스트/멀티캐스트 데이터를 전송하는 것을 포함한다. The method may also, by all nodes in the network, assigning a predetermined time period, a higher accessing tuning at the start with the control channel, and the broadcast / multicast transmission for a priority, and therefore, unicast data is before it can be transmitted in the control channel in the beginning of the period P includes transmitting the broadcast / multicast data. 본 방법은 또한 브로드캐스트/멀티캐스트 예약들에 더 높은 액세스 우선순위를 할당하고, 이에 따라 데이터 채널들에 대한 유니캐스트 예약들이 주기 P의 시작에서 컨트롤 채널에 전송될 수 있기 전에 브로드캐스트/멀티캐스트 예약들을 전송하는 것을 포함한다. The method further includes broadcast / multicast booking of further assigned a higher access priority, and thus the broadcast before the unicast reservation for the data channel may be sent on the control channel at the start of a period P along / multicast to It includes transmitting the reservation. 무선 네트워크에서 브로드캐스트/멀티캐스트 데이터를 전송하는 방법의 또 다른 상세 실시예에서, 네트워크는 복수의 다중-라디오 노드들 및/또는 단일-라디 오 노드들을 포함하고, 네트워크는 또한 단일-라디오 및 다중-라디오 노드들 모두에 의해 액세스 가능한 적어도 하나의 데이터 채널 및 컨트롤 채널을 포함한다. In a wireless network in a broadcast / multicast implementation another detail of the casting method of transmitting data, the network comprises a plurality of multi-radio nodes and / or single-comprising radio node, the network is also a single-radio and multi- - comprises at least one data channel and a control channel accessible by all of the radio nodes. 본 방법은 네트워크의 모든 노드들에 의해, 정해진 시간에 주기의 시작에서 단일-라디오 노드들에 의해 액세스 가능한 데이터 채널들 및 컨트롤 채널을 릴리즈하는 것을 포함한다. The method in one by all nodes in the network, the start of the cycle at any given time - involves the release of the available data channel access by the radio node and the control channel. 본 방법은 또한 네트워크의 모든 노드들에 의해, 정해진 시간에 주기의 시작에서 컨트롤 채널로 튜닝하는 것을 포함한다. The method also includes tuning to the control channel in by all nodes in the network, the start of the cycle at a specified time. 추가적으로, 본 방법은, 만약 세팅하면 노드가 채널에 전송되는 것을 막는, 채널(NAV)에 대한 타이머를, 정해진 시간에 주기의 시작에서 세팅하는 것을 포함한다. If further, the method comprises, if the set comprises a node setting a timer for stopping the delivery of the channel, the channel (NAV), at the start of the cycle at a specified time. 단일-라디오 노드들에 의해 액세스 가능한 모든 데이터 채널들의 NAV는 정해진 시간에 주기의 시작에서 상수 값(CS)으로 세팅되고, 컨트롤 채널의 NAV는 정해진 시간에 주기의 시작에서 0을 세팅된다. Single - NAV of all the data channel that is accessible by the radio node is set at the start of the cycle at any given time to a constant value (CS), NAV in the control channel is set to zero at the start of the cycle at a specified time. 본 방법은 또한 지정된 창(window)(BW) 동안 주기의 시작에서 컨트롤 채널에의 유니캐스트 데이터의 전송을 허용하지 않는 것을 포함한다. The method also includes the specified window (window) (BW) period begins that do not allow the transmission of the unicast data in the control channel in a while. 추가적으로, 본 방법은 유니캐스트 데이터의 예약 프레임들보다 그러한 예약을 위한 프레임들의 컨트롤 채널에서의 전송에 더 높은 우선순위를 할당함으로써, 브로드캐스트/멀티캐스트 전송을 위해 데이터 채널을 예약하는 것을 포함하며, 이에 따라 그들의 라디오가 다른 채널로 튜닝하기 전에, 예약 정보가 모든 단일-라디오 노드들에 의해 수신될 수 있도록 해준다. Additionally, the present method includes reserving a data channel for the broadcast / multicast transmission by assigning a higher priority to the transmission on the control channel of a frame for such a reservation than reservation frame of the unicast data, Accordingly, before their radio tuned to a different channel, the reservation information every single - allows the radio to be received by the node. 본 발명의 상세 실시예에서, 데이터 채널에서의 브로드캐스트/멀티캐스트 전송을 위한 예약 프레임들의 우선순위화는 2006년 7월 26일자로 출원된 함께 동시-계류중인 특허 출원 대리인 문서번호 AVA06-36에 기재된 방법에 의해 달성된다. In a detailed embodiment of the present invention, the priority of the scheduled framing for the broadcast / multicast transmission of the data channel is concurrent with the filed July 26, 2006 - a patent-pending Attorney Docket No. AVA06-36 It is achieved by the described method. 다른 실시예들은 복수의 다중-라디오 노드들을 포함하는 무선 네트워크에서 브로드캐스트/멀티캐스트 데이터를 전송하기 위한 컴퓨터로 판독가능한 코드를 갖는 컴퓨터로 판독가능한 매체를 포함하며, 여기서 무선 네트워크는 컨트롤 채널 및 적어도 하나의 데이터 채널을 갖는다. Other embodiments a plurality of multi-comprises a radio node, the broadcast / multicast computer-readable media having a readable code in a computer for transmitting data in a wireless network including, where the wireless network is a control channel and at least It has a single data channel. 컴퓨터로 판독가능한 매체는 각 다중-라디오 노드들의 하나의 라디오를 컨트롤 채널로 튜닝하고, 브로드캐스트/멀티캐스트 데이터를 컨트롤 채널에서 복수의 노드들로 전송하기 위한 명령어들을 포함한다. Includes instructions for transmitting to a plurality of nodes from the radio nodes a radio tuned to the control channel, and the broadcast / multicast data, the control channel of - computer-readable medium is a multi-angle. 또 다른 실시예는 복수의 다중-라디오 노드들을 포함하는 무선 네트워크에서 브로드캐스트/멀티캐스트 데이터를 전송하기 위한 컴퓨터로 판독가능한 코드를 갖는 컴퓨터로 판독가능한 매체를 포함하며, 여기서 무선 네트워크는 컨트롤 채널 및 적어도 하나의 데이터 채널을 더 포함한다. Another embodiment is a plurality of multi-including a computer-readable media having a readable code in a wireless network including a radio node to the computer for transmitting broadcast / multicast data, wherein the wireless network is a control channel, and and further comprising at least one data channel. 컴퓨터로 판독가능한 매체는 각 다중-라디오 노드들의 하나의 라디오를 컨트롤 채널로 튜닝하고, 브로드캐스트/멀티캐스트 전송을 위한 데이터 채널을 선택하고, 선택된 데이터 채널에서 브로드캐스트/멀티캐스트 데이터를 전송하기 위한 명령어들을 포함한다. Computer-readable media are each a multiple-tuning one of the radio of the radio node to the control channel, broadcast / select a data channel for the multicast transmission and, on the selected data channel is broadcast / multicast to transmit data It includes instructions. 또 다른 실시예는 컨트롤 채널 및 적어도 하나의 데이터 채널을 갖는 무선 네트워크에서 브로드캐스트/멀티캐스트 데이터를 전송하기 위한 컴퓨터로 판독가능한 코드를 갖는 컴퓨터로 판독가능한 매체를 포함하며, 여기서 복수의 노드들은 적어도 하나의 단일-라디오 노드를 포함한다. Another embodiment is a control channel and at least in a wireless network with one data channel includes a computer-readable media having a readable code to the computer for transmitting broadcast / multicast data, in which a plurality of nodes at least including the radio nodes - one single. 컴퓨터로 판독가능한 매체는, 네트워크의 모든 노드들에 의해, 미리 정해진 시간 동안 주기의 시작에서 단일-라디오 노드들에 의해 액세스 가능한 모든 데이터 채널들 및 컨트롤 채널을 릴리즈하기 위한 명령어들을 포함한다. Computer-readable media is, by all nodes in the network, one at the beginning of the cycle for the predetermined time includes the instructions for the release of all possible data channel access by the radio node and the control channel. 본 컴퓨터로 판독가능한 매체는 또한, 네트워크의 모든 노드 들에 의해, 미리 정해진 시간 동안 주기의 시작에서 컨트롤 채널로 튜닝하고, 브로드캐스트/멀티캐스트 전송들을 더 높은 액세스 우선순위로 할당하며, 이에 따라, 유니캐스트 데이터가 주기 P의 시작에서 컨트롤 채널에 전송될 수 있기 전에 브로드캐스트/멀티캐스트 데이터를 전송하기 위한 명령어들을 포함한다. Readable media computer is also, by all nodes in the network, allocates and tune to the control channel at the beginning of the cycle for the predetermined time, the broadcast / multicast transmission with a higher access priority, and thus, the unicast data includes instructions for transmitting the broadcast / multicast data, before it can be transmitted in the control channel at the beginning of the period P. 본 컴퓨터로 판독가능한 매체는 또한 브로드캐스트/멀티캐스트 예약들에 더 높은 액세스 우선순위를 할당하고, 이에 따라 데이터 채널들에 대한 유니케스트 예약들이 주기 P의 시작에서 컨트롤 채널에 전송될 수 있기 전에 브로드캐스트/멀티캐스트 예약들을 전송하기 위한 명령어들을 포함한다. Readable media computer is also broadcast before the broadcast / allocating higher access priority to the multicast reservation, thereby to unicast reservation for the data channel may be sent on the control channel at the start of a period P along It includes instructions for transmitting broadcast / multicast schedule. 또 다른 실시예는 무선 네트워크에서 브로드캐스트/멀티캐스트 데이터를 전송하기 위한 컴퓨터로 판독가능한 코드를 갖는 컴퓨터로 판독가능한 매체를 포함하며, 여기서 네트워크는 복수의 다중-라디오 노드들 및/또는 단일-라디오 노드들을 포함하고, 네트워크는 또한 단일-라디오 및 다중-라디오 노드들에 의해 액세스 가능한 적어도 하나의 데이터 채널들 및 컨트롤 채널을 포함한다. Another embodiment includes a computer-readable media having a readable code to the computer for transmitting broadcast / multicast data in a wireless network, wherein the network includes a plurality of multi-radio nodes and / or single-radio comprising nodes and networks are also single-comprises at least one data channel that is accessible by the radio nodes and the control channel and multi-radio. 컴퓨터로 판독가능한 매체는, 네트워크의 모든 노드들에 의해, 미리 정해진 시간에 주기의 시작에서 단일-라디오 노드들에 의해 액세스 가능한 데이터 채널들 및 컨트롤 채널을 릴리즈하기 위한 명령어들을 포함한다. Computer-readable media is, by all nodes in the network, one at the beginning of the period to the predetermined time comprises: instructions for releasing the radio nodes a data channel and a control channel accessible by. 본 컴퓨터로 판독가능한 매체는 또한, 네트워크의 모든 노드들에 의해, 미리 정해진 시간에 주기의 시작에서 컨트롤 채널로 튜닝하기 위한 명령어들을 포함한다. The computer readable media also, by all nodes in the network, and includes instructions for tuning to the control channel at the start of the period to the predetermined time. 추가적으로 본 컴퓨터로 판독가능한 매체는, 만약 세팅되면 노드가 채널에 전송되는 것을 막는, 채널(NAV)에 대한 타이머를, 정해진 시간에 주기의 시작에서 세팅하는 것을 포함한다. When the addition to the computer-readable medium is, if the setting involves the node is set to prevent the transmission channel, a timer for the channel (NAV), at the start of the cycle at a specified time. 단일-라디오 노드들에 의해 액세스 가능한 모든 데이터 채널들의 NAV는 정해진 시간에 주기의 시작에서 상수 값(CS)으로 세팅되고, 컨트롤 채널의 NAV는 정해진 시간에 주기의 시작에서 0을 세팅된다. Single - NAV of all the data channel that is accessible by the radio node is set at the start of the cycle at any given time to a constant value (CS), NAV in the control channel is set to zero at the start of the cycle at a specified time. 본 컴퓨터로 판독가능한 매체는 또한, 지정된 창(BW) 동안 주기의 시작에서 컨트롤 채널에의 유니캐스트 데이터의 전송을 허용하지 않도록 하기 위한 명령어들을 포함한다. Medium with the computer program product also includes instructions for the given window so as not to permit the transmission of the unicast data of the control channel at the start of the period for (BW). 추가적으로, 본 컴퓨터로 판독가능한 매체는 유니캐스트 데이터의 예약 프레임들보다 그러한 예약을 위한 프레임들의 컨트롤 채널에서의 전송에 더 높은 우선순위를 할당함으로써, 브로드캐스트/멀티캐스트 전송을 위해 데이터 채널을 예약하기 위한 명령어들을 포함하며, 이에 따라 그들의 라디오가 다른 채널로 튜닝하기 전에, 예약 정보가 모든 단일-라디오 노드들에 의해 수신될 수 있도록 해준다. Additionally, the readable media the computer to reserve a data channel by assigning a higher priority to the transmission, for broadcast / multicast transmissions in a control channel of a frame for such a reservation than reservation frame of the unicast data, and includes instructions for, and thus prior to their radios tuned to different channels, reservations are all single - allows the radio to be received by the node. 본 발명의 상세 실시예에서, 데이터 채널에서의 브로드캐스트/멀티캐스트 전송을 위한 예약 프레임들의 우선순위화는 2006년 7월 26일자로 출원된 함께 동시-계류중인 특허 출원 대리인 문서번호 AVA06-36에 기재된 방법에 의해 달성된다. In a detailed embodiment of the present invention, the priority of the scheduled framing for the broadcast / multicast transmission of the data channel is concurrent with the filed July 26, 2006 - a patent-pending Attorney Docket No. AVA06-36 It is achieved by the described method. 그 밖의 실시예들은 본 발명의 실시예들로서 여기에 기재된 모든 방법 동작들을 처리하도록 구성된 노드(단일-라디오 노드 또는 다중-라디오 노드)를 포함한다. Other embodiments are nodes that are configured to process all the method operations disclosed herein as embodiments of the present invention comprises a (single-radio nodes a radio node, or a multiple). 그 실시예들에서, 노드는 메모리 시스템, 프로세서, 그들 구성들과 연결하는 상호연결 메커니즘의 통신 인터페이스를 포함한다. In the embodiment, the node comprises a communications interface of the interconnection mechanism for connecting with a memory system, a processor, their configuration. 메모리 시스템은 프로세스에서 수행될 때(예, 실행될 때), 여기서 설명한 바와 같은 무선 네트워크에서 브로드캐스트/멀티캐스트 데이터를 전송하는 것을 제공하는 프로세스가 인코딩되어 있으며, 여기서 설명한 바와 같이, 봉 발명의 실시예들로서 설명된 모든 방법 실시예들 및 동작들을 수행하기 위한 컴퓨터화된 디바이스내에서 동작한다. The memory system is the process that provides for transmitting the broadcast / multicast data in a wireless network as described above when executed on the process (e.g., when it runs), wherein the encoding, as discussed herein, embodiments of the rods invention all embodiments of the methods described as operated in the computerized device to perform the examples and operations. 따라서, 여기서 설 명한 처리를 수행 또는 수행하기 위해 프로그래밍된 임의의 컴퓨터화된 디바이스가 본 발명의 실시예가 된다. Thus, the set of commanded processing performance, or any of the computer programmed to perform the screen where the device is an embodiment of the present invention. 본 발명의 또 다른 실시예는 BSS(Basic Service Set)/메시 무선 네트워크를 포함한다. Yet another embodiment of the present invention includes a BSS (Basic Service Set) / mesh wireless network. 무선 네트워크는 액세스 포인트(AP) 및 복수의 스테이션들을 포함하며, 스테이션들 중 적어도 하나는 컨트롤 채널을 포함하는 무선 통신 경로를 통해 AP와 통신한다. The wireless network includes access points (AP) and a plurality of stations, at least one of the stations is in communication with the AP over the wireless communication path, including the control channel. 무선 네트워크 내에서, AP와 적어도 하나의 스테이션은 공통 컨트롤 채널(CCC)를 통해 통신하며, 여기서 BBS 서빙 채널은 CCC 프로토콜을 위한 컨트롤 채널로 이용된다. In a wireless network, AP and at least one station is in communication via a common control channel (CCC), wherein BBS serving channel is used as a control channel for the CCC protocol. 여기에 기재된 본 발명의 실시예들의 다른 구성들은 위에서 요약되고, 이하에서 상세히 기술되는 방법 실시예 공정들 및 동작들을 수행하기 위한 소프트웨어 프로그램들을 포함한다. Other configurations of the embodiments of the invention disclosed herein include software programs to perform the method embodiment of the process and operation which are summarized above, described in detail below. 보다 구체적으로, 컴퓨터 프로그램 제품은, 컴퓨터화된 디바이스에서 수행될 때, 여기서 설명한 바와 같이 무선 네트워크에서 브로드캐스트/멀티캐스트 데이터를 전송하는 것을 제공하는 연관 동작들을 제공하는 인코딩된 컴퓨터 프로그램 논리를 포함하는 컴퓨터-판독가능한 매체를 갖는 일 실시예이다. More specifically, the computer program product, a computer, when executed on a screen device, in which described that includes an encoded computer program logic for providing associated operable to provide the transfer of broadcast / multicast data in a wireless network as described computer - is one embodiment having a readable medium. 컴퓨터 프로그램 논리는, 컴퓨터 시스템에서 적어도 하나의 프로세서에서 실행될 때, 프로세서가 봉 발명의 실시예들로서 여기서 언급한 동작들(예, 방법들)을 수행하도록 한다. The computer program logic may be in a computer system to carry out at least when run on one processor, the processor is in operation depicted here as an embodiment of the invention, rods (e.g., methods). 본 발명의 그러한 구성들은 일반적으로 예컨대, 광학 매체(예, CD-롬), 플로피 또는 하드 디스크와 같은 컴퓨터로 판독가능한 매체 또는 하나 이상의 롬(ROM) 또는 램(RAM) 또는 PROM 칩들과 같은 그 밖의 매체에 배열 또는 인코딩된 소프트웨어, 코드 및/또는 배열된 그 밖의 데이터 구조들로서 제공되거나, 또는 주 문형 반도체(application specific integrated circuit; ASIC) 또는 하나 이상의 모듈들에 다운로드 가능한 소프트웨어 이미지들, 공유된 라이브러리들, 등으로 제공된다. Such a configuration of the present invention may generally be, for example, optical media (e.g., CD- ROM), floppy or hard disk, and a computer readable medium or in one or more of read-only memory (ROM) or random access memory (RAM) or else such as a PROM chips arranged or encoded on the medium, software, or provided as the other data structures the code and / or arrays, and-demand semiconductor; s (application specific integrated circuit ASIC), or downloadable software images in one or more modules, shared libraries It is provided with, and the like. 소프트웨어 또는 펌웨어 또는 그 밖의 그러한 구성들은 컴퓨터화된 디바이스에 인스톨되어, 컴퓨터화된 디바이스 내의 하나 이상의 프로세서가 본 발명의 실시예들로서 설명한 기술들을 수행하도록 할 수 있다. Software or firmware or other such configurations can be to perform the techniques explained as embodiments of being installed on a computerized device, the one or more processors in the computerized device of this invention. 예컨대, 데이터 통신 디바이스들 또는 다른 엔티티들의 그룹과 같은, 컴퓨터화된 디바이스들의 집합에서 동작하는 소프트웨어 프로세스들이 또한 본 발명의 시스템을 제공할 수 있다. For example, a software process running on the set, of computerized device such as a group of data communications devices or other entities can also provide the system of the present invention. 본 발명의 시스템은 다수의 데이터 통신 디바이스에서의 많은 소프트웨어 프로세스들 간에 분배될 수 있고, 또는 모든 프로세스들이 제공된 컴퓨터들의 작은 세트 또는 하나의 컴퓨터 단독에서 실행될 수도 있다. The system of the present invention can be distributed between many software processes on the plurality of data communications devices, or all processes could run on a small set of computers, or one computer alone provided. 본 발명의 실시예들은 예컨대, 데이터 통신 디바이스 내에서, 소프트웨어 프로그램으로서, 소프트웨어 및 하드웨어로서, 또는 하드웨어 및/또는 회로 단독으로서, 엄격히 구현될 수 있는 것으로 이해되어야 한다. Embodiments of the present invention is to be understood that, strictly be implemented, for example, in a data communication device, as a software program, as software and hardware, or hardware and / or as a single circuit. 본 발명의 특징들은 설명한 바와 같이, 예컨대, 아바야 회사(Avaya Inc. of Lincroft, 뉴 저지)에 의해 제조된 것과 같은 그러한 디바이스들을 위한 소프트웨어 시스템들 및/또는 데이터 통신 디바이스들에 적용될 수 있다. Features of the present invention may be applied to, for example, the company Abaya (Avaya Inc. of Lincroft, New Jersey) to a software system and / or a data communication device for such devices such as those manufactured by, as described. 전술한 바는, 상이한 도면들에서 동일한 구성들에 관해 동일한 참조 부호들을 부여한 수반되는 도면들에 도시된 바와 같이, 후술하는 본 발명의 바람직한 실시예들의 보다 상세한 설명으로부터 명백할 것이다. The foregoing, as illustrated in the accompanying drawings given the same reference numerals with respect to the same structure in different drawings, will be apparent from the more detailed description of the preferred embodiments of the invention as described below. 도면들은 축적일 필요가 없으 며, 대신 본 발명의 원리들을 도시하는데 있어서 중점을 둔다. Figures are said not have necessarily accumulated, instead it focuses according to illustrate the principles of the invention. 단일-라디오 노드들을 가진 네트워크, 멀티-라디오 노드들을 가진 네트워크, 및 단일-라디오 노드들 및 멀티-라디오 노드들이 결합된 네트워크에서, 브로드캐스트/멀티캐스트 데이터의 효율적인 전송을 제공하기 위한 방법, 장치 및 소프트웨어가 제공된다. Single-network, and one with the radio node-network, multi with the radio nodes a radio node and a multi-radio nodes are combined network, a method for providing an efficient transmission of broadcast / multicast data, the apparatus and the software is provided. 브로드캐스트/멀티캐스트 데이터는 동시에 전송될 수 있는 다수의 목적지(destination)들에 보내짐으로써, 다른 사람들에 의해 이용 가능한 채널들을 남긴다. By the broadcast / multicast data is sent to multiple destinations (destination) that can be transmitted at the same time, Jim, leaving the channels used by others. 브로드캐스트 데이터는 네트워크의 모든 노드에 보내지는 데이터를 포함하는 반면, 멀티캐스트 트래픽은 수신 목록 및 트래픽의 양에 따라 변화된다. Broadcast data, on the other hand that comprises data sent to all the nodes in the network, multicast traffic is changed according to the amount of the reception list and traffic. 브로드캐스트 데이터의 예들은 컨트롤 채널의 변경, 프로브 요청(probe request), 파워 다운의 통지 등을 포함한다. Examples of broadcast data include a change in the control channel, the probe request (probe request), the notification of the power-down or the like. 전술한 바와 같이, 멀티캐스트 데이터는 다수 수신자에게 향하는 데이터이며, 예들로 인터넷 라디오/음악, 그룹 게이밍, 기업 데이터 분배(corporate data distribution) 등을 포함한다. As described above, the multicast data is data directed to multiple recipients, and includes an internet radio / music to the examples, the group of gaming, enterprise data distribution (corporate data distribution) and the like. 브로드캐스트/멀티캐스트 데이터는 짧은 데이터 또는 긴 데이터일 수 있다. Broadcast / multicast data can be short or long data data. 상이한 규칙들이 멀티캐스트의 상이한 유형들의 전송에 적용되며, 이들 규칙들은 프로토콜에 따라 변화된다. Different rules apply to the transmission of different types of multicast, these rules are changed according to the protocol. 브로드캐스트/멀티캐스트 데이터의 전송을 적절히 수행하기 위해, 컨트롤 채널이 요구된다. In order to properly perform the transmission of broadcast / multicast data, the control channel is required. 브로드캐스트/멀티캐스트 데이터를 전송하는 노드는 데이터를 전송하기 위해 채널에 액세스할 수 있어야 하며, 노드들은 데이터가 전송될 때 그 채널로 튜닝되어야 한다. Broad node cast / multicast transmission data must be able to access the channel for transmitting the data, the nodes when the data is transferred to be tuned to that channel. 공통(common) 컨트롤 채널은 언제 어떤 채널에서 멀티캐스트 전송이 일어나 는지를 조정하기 위해, 전송 및 수신 노드들에 관한 방법을 제공한다. Common (common) control channel to adjust how and when the multicast transmission up in some channels, there is provided a method according to the transmitting and receiving nodes. 다중-라디오 노드들에 대해, 모든 노드들은 공통 컨트롤 채널에 제공되는 라디오를 갖는다. The multi-radio for the node, all nodes have a radio that is provided to the common control channel. 도 1을 참조하면, 유니캐스트 데이터를 전송하는 멀티-라디오 노드들을 포함하는 타이밍도가 도시되어 있다. 1, a multi-transmitting the unicast data - there is shown a timing diagram including a radio node. 타이밍도는 컨트롤 채널 및 트래픽 채널들 1-4을 나타내는, 4개의 데이터 트래픽(MT) 채널들을 포함한다. The timing diagram includes the control channel and traffic channel represents a 1-4, four data traffic (MT) channel. 컨트롤 채널에서 발생하고 데이터 채널들의 효율적인 사용을 허용하는 유니캐스트 트래픽(CC-RTS/CC-CTS)에 대한 예약들이 도시되어 있다. Occurs in the control channel and scheduling for unicast traffic (CC-RTS / CC-CTS) to allow efficient use of the data channel are illustrated. 컨트롤 채널 및 데이터 채널들은 거의 항상 그들의 최대 용량이 이용되기 때문에, 유니캐스트 트래픽에 대해 소모되는 대역폭이 매우 적음을 주목해야 한다. Control channel and data channel should almost always pay attention to because of their maximum capacity available, so the bandwidth consumed for the less unicast traffic. 브로드캐스트/멀티캐스트 데이터를 이용하는 환경들 및 멀티-라디오 노드들을 포함하는 환경들에 대해, 모든 노드들은 적어도 2개의 라디오들을 포함하고, 라디오들 중 하나는 공통 컨트롤 채널에 제공된다. Broadcast / multicast environment of using the data and the multi-for the environment including radio node, all nodes are one of, the radio comprising at least two radios are provided on a common control channel. 예약 요청은 그룹에 어드레스된 CC-RTS로 달성되며, CC-CTS 응답은 요구되지 않는다. Reservation requests are achieved with a CC-RTS to the group address, CC-CTS response is required. 목적지 어드레스는 노드들의 그룹(멀티캐스트) 또는 네트워크와 연관된 모든 노드들 중 하나를 가리키며, 확인 응답은 요구되지 않는다. The destination address is pointing to one of the nodes associated with the group (multicast), or a network of nodes, the acknowledgment is not required. 데이터(유니캐스트/멀티캐스트/브로드캐스트)는 트래픽 채널들 또는 컨트롤 채널 중 하나에 전송될 수 있다. Data (unicast / multicast / broadcast) may be transmitted to one of the traffic channel or control channel. 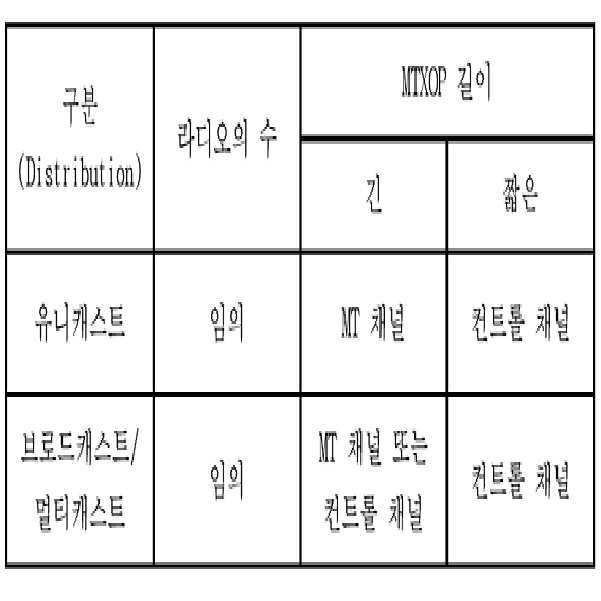 데이터 전송에 사용할 채널의 선택은 MTXOP 길이에 좌우된다. Selection of a channel used for data transmission is dependent upon the length MTXOP. MT 채널들에 대한 예약들이 이루어질 수 없기 때문에, 컨트롤 채널에서의 긴 MTXOP들의 전송은 MT 채널들의 이용을 감소시킨다. Because it has made reservations for the MT-channel, transmission of a long MTXOP on the control channel reduces the use of MT channels. 짧은 프레임들은 예약 없이, 또는 레거시 RTS/CTS로 컨트롤 채널에서 전송될 수 있다. Short frames can be transmitted in a control channel to, or legacy RTS / CTS without reservation. 도 2는 컨트롤 채널에서 발생하는 멀티캐스트 데이터의 짧은 브로드캐스트의 타이 밍도를 도시한 것이다. Figure 2 is a timing of the short broadcast of the multicast data is generated in the control channel shown. 컨트롤 라디오는 브로드캐스트/멀티캐스트 데이터를 전해 받기 위해 이용 가능하다. Radio control is available to receive delivery of broadcast / multicast data. 모든 노드들은 컨트롤 채널에 제공된 라디오를 갖는다. Every node has a radio provided in the control channel. 짧은 MTXOP들(예, 네트워크 시그널링)은 예약 없이 또는 레거시 RTS/CTS로 컨트롤 채널에서 전송될 수 있다. MTXOP short (for example, a network signaling) may be sent on the control channel without a reserved or a legacy RTS / CTS. 브로드캐스트는 짧은 브로드캐스트이기 때문에, 트래픽 채널들의 예약들에 거의 또는 아무 영향이 없으며, 이용 가능한 대역폭의 사용이 효율적이다. This broadcast is not because it is a short broadcast, with little or no effect on the reserve of the traffic channel, the efficient use of available bandwidth. 도 3으로 참조하면, MT 채널들에 대한 예약들이 이루어질 수 없기 때문에, 컨트롤 채널상의 긴 MTXOP들의 전송은 MT 채널들의 이용을 감소시킨다. 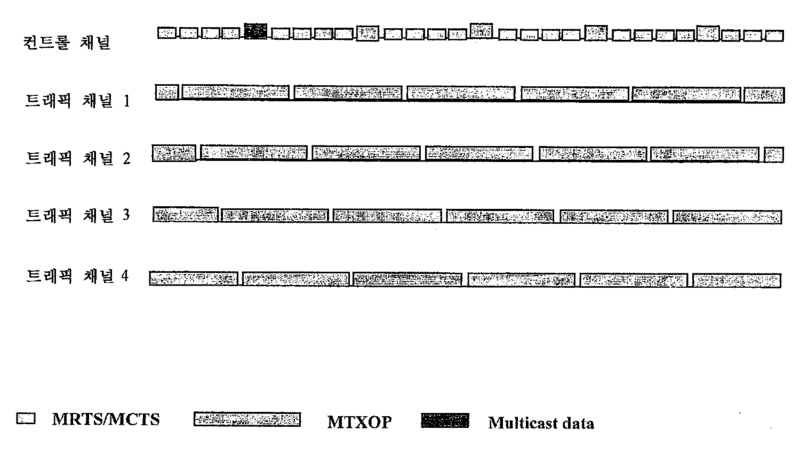 Referring to Figure 3, because then they could be reserved for the MT channel, the transmission of long MTXOP on the control channel is reduced to the use of MT channel. 도 2와 비교하면, 채널들의 예약이 컨트롤 채널에서의 멀티캐스트 데이터 전송이 완료될 때까지 기다려야 하기 때문에, 데이터 채널들의 이용이 최적이 되지 못한다. Compared with Figure 2, the reservation of the channel because the wait for the multicast data transmission is completed in the control channel, not the use of the data channel is not optimal. 이것은 대역폭의 일정 양을 충분히 이용하지 못하기 때문에, 이러한 유형의 동작의 효율성을 감소시킨다. This is because it does not make full use of a certain amount of bandwidth, which reduces the effectiveness of this type of operation. 도 4 및 도 5를 참조하면, MT 채널에서의 긴 MTXOP들의 전송은 다른 MT 채널들에 대한 전송 및 예약들에 이용 가능한 컨트롤 채널을 남겨둔다. Even if 4 and 5, the transfer of long MTXOP in MT channels are left available control channel used for the transport and booking channels for other MT. 도 5에서, 트래픽 채널 3을 이용하는 노드는 두 개의 데이터 라디오를 갖는다. 5, the node using the traffic channel 3 has two data radio. 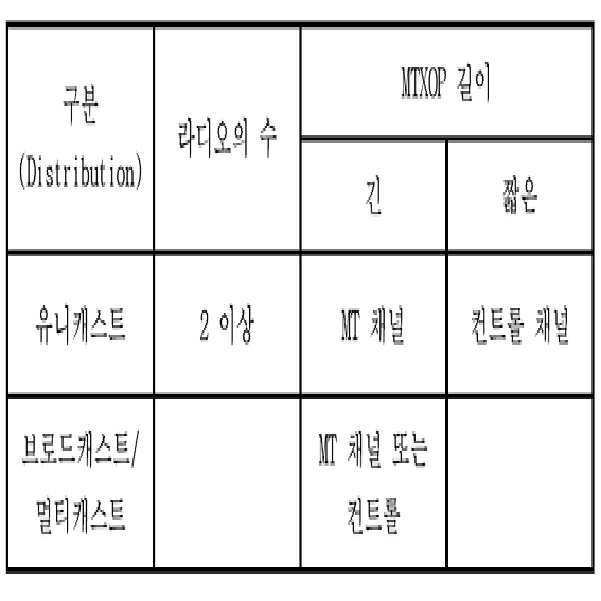 MT 채널에서 긴 브로드캐스트/멀티캐스트 MTXOP들을 전송하기 위해, 전송에 연루된 모든 노드들은 반드시 MT 라디오/채널을 비워야 한다. To transmit long broadcast / multicast MTXOP in MT-channel, all nodes are involved in the transfer must vacate the MT Radio / channel. 브로드캐스트/멀티캐스트를 그들과 연루시키기 위한 MT 채널의 예약을 전해 받은 노드들은 MT 라디오를 선택된 MT 채널로 튜닝한다. Broadcast / node receives delivery of the booking channel MT for multicast to be involved and they are tuned to the selected channel MT MT radio. 만약 MT 라디오가 이용 가능하지 않다면, 브로드캐스트/멀티캐스트에 연루된 노드는 MT 라디오에서의 MTXOP를 포기한다. If the MT if the radio is not available, the nodes involved in a broadcast / multicast must abandon MTXOP in MT radio. 임의의 인터럽트된 MTXOP들을 완료하기 위해, 브로드캐스트/멀티캐스트가 완료될 때 새로운 예약들이 컨트롤 채널에서 이루어진다. In order to complete any of the interrupt MTXOP, broadcast / multicast is to be completed when the new reservations are made on the control channel. 데이터 채널들을 위해 추가적인 예약들이 컨트롤 채널에서 이루어질 수 있기 전에는 기다릴 필요가 없기 때문에, 보는 바와 같이, 긴 멀티캐스트 데이터 전송이 컨트롤 채널 대신에 데이터 채널에서 이루어지도록 함으로써 효율성을 높일 수 있다. Since there is no need to wait until it additional reservation may be made on the control channel to the data channel, as shown, there is a long-multicast data transfer to increase the efficiency to occur in the data channel, instead of the control channel. 표 1은 데이터의 유형, 노드들에서의 라디오들의 수, 및 데이터 전송의 길이에 따른 데이터 전송을 위해 사용하기 위한 선호 채널을 도시한 것이다. Table 1 illustrates a preferred channel to use for data transmission in accordance with the length of the type of data, the number of radios at the nodes, and data transfer. 네트워크는 단지 단일-라디오 노드들을 포함할 수 있고, 또한 브로드캐스트/멀티캐스트 데이터 전송을 제공하기 위해 이용될 수 있다. Network is only a single - may comprise a radio node, or may be used to provide broadcast / multicast data transfer. 이러한 유형의 환경에 대해, 모든 노드들은, 다중-채널 타겟 비콘 전송 시간들(multi-channel target beacon transmission times; MTBTT)로 불리는 주기의 시작에서 모든 채널들을 릴리즈하고, 컨트롤 채널로 튜닝한다. For this type of environment, all nodes, a multi-channel target beacon transmission time of; release all the channels at the start of the period referred to (multi-channel target beacon transmission times MTBTT), and tune to the control channel. 모든 전송들은 다음 MTBTT까지 완료되어야 한다. All transport should be completed by the following MTBTT. MTBTT에서, 각 노드는 모든 데이터 채널들(DC) 세트의 NAV들을 미리 정해진 상수 값으로 세팅하고, 공통 컨트롤 채널의 NAV를 0으로 세팅한다. In MTBTT, each node sets the NAV for all data channels (DC) set to a predetermined constant value, and setting the NAV of the common control channel to zero. 노드에 보류중인 모든 멀티캐스트 데이터는 MTXOP에 위치한다. All multicast data held in the node that is being placed on MTXOP. 도 6은 각각 시작 포인트를 가진 주기들(P)을 보여주는 타이밍도를 도시한 것이다. 6 illustrates a timing diagram showing the periods (P) having a start point, respectively. 각 주기는 이하에 후술하는 바와 같이, 또한 CS 시간 주기 및 BW 시간 주기를 포함한다. As each cycle is described below, also it includes a CS time period and a time period BW. 멀티캐스트 MTXOP는 컨트롤 채널 또는 MT 채널 중 하나에서 전송될 것이다. Multicast MTXOP will be transferred from one control channel or channels MT. 노드는 MTBTT에 곧 뒤따르는 BW 시간 주기 동안, 컨트롤 채널에서 데이터 트래픽을 포함하는 MTXOP를 전송하지 않는다. The node does not transmit the MTXOP, including data traffic in the time period during BW followed soon MTBTT, control channel. 멀티캐스트 데이터 MTXOP는, MT 채널들에 대한 임의의 예약들이 발생할 수 있기 전에, 또한 라디오들이 MT 채널들로 리턴되기 전에, 먼저 전송된다. Multicast data MTXOP, before they can cause any reservation for MT Channel, and before they returned to the MT radio channel, is transmitted first. 멀티캐스트 데이터가 존재하지 않는 경우, 데이터 트래픽 전송에 관한 CC-RTS/CC-CTS 예약들은 MTBTT에 뒤따르는 CS에서 시작된다. If the multicast data that does not exist, CC-RTS / CC-CTS reservations about the data traffic transmission are started from the CS followed by the MTBTT. 이것은 도 7에 도시된 3개의 시나리오에 나타난다. This is indicated in the three scenarios shown in Fig. 도 8은 짧은 멀티캐스트가 컨트롤 채널에서 전송되는 단일-라디오 노드들을 가진 네트워크에 대한 타이밍도를 도시한 것이다. 8 is that a single, short multicast transmission on the control channel is a timing diagram of a radio network having nodes shown. 멀티캐스트 데이터가 먼저 전송되고, 이후 남은 데이터 채널들 및 컨트롤 채널에서의 트래픽 전송이 뒤따른다. Multicast data is transmitted first, this traffic transmission in the rest of the data channel and the control channel since followed. 도 9는 짧은 멀티캐스트가 트래픽 채널에서 전송되는 단일-라디오 노드들을 가진 네트워크에 대한 타이밍도를 도시한 것이다. Fig. 9 is a short single multicast transmitted from the traffic channel shows a timing diagram for a network with the radio node. 다시, 멀티캐스트 데이터가 먼저 전송되고, 이후 동일한 주기에서 컨트롤 채널 및 다음 주기들 동안 데이터 채널들에서 데이터 전송이 뒤따른다. Again, the multicast data is sent first, followed by a subsequent period in the same control channel and the data transmitted in the data channel for the next cycle. 도 10은 짧은 멀티캐스트가 BW(MT 채널들에 대한 예약들이 단지 컨트롤 채널에서 허용되는 시간 창(time window))의 이용 없이, 트래픽 채널에서 전송되는 단 일-라디오 노드들을 가진 네트워크에 대한 타이밍도를 도시한 것이다. 10 is just a short multicast transmitted from the traffic channel without the use of (time window (time window) that is scheduled are only allowed in the control channels for the MT-channel) BW day - timing for networks with radio nodes the shows. 다시, 멀티캐스트 데이터가 먼저 전송되고, 그 후 동일한 주기에서 컨트롤 채널 및 다음 주기들 동안 데이터 채널들에서 데이터 전송이 뒤따른다. Again, the multicast data is sent first, then followed by the data transmitted in the control channel and the data channel for the next cycle in the same cycle. 도 11은 짧은 멀티캐스트가 조정 가능한 BW의 이용과 함께 트래픽 채널에서 전송되는 단일-라디오 노드들을 가진 네트워크에 대한 타이밍도를 도시한 것이다. Figure 11 is a single to be transmitted in a traffic channel with the use of available short multicast adjust BW - shows a timing diagram for a network with the radio node. 멀티캐스트 데이터가 먼저 전송되고, 그 후 동일한 주기에서 컨트롤 채널들 및 다음 주기들 동안 데이터 채널들에서의 데이터 전송이 뒤따른다. Multicast data is transmitted first, then followed by a data transmission in a data channel over the control channel in the same period and the next period. 도 12는 긴 멀티캐스트가 BW를 이용과 함께 트래픽 채널에서 전송되는 단일-라디오 노드들을 가진 네트워크에 대한 타이밍도를 도시한 것이다. 12 is a single long multicast is transmitted in a traffic channel with the use of BW - shows a timing diagram for a network with the radio node. 멀티캐스트 데이터가 먼저 전송되고, 그 후 동일한 주기에서 트래픽 채널들 및 다음 주기들 동안 데이터 채널들에서의 데이터 전송이 뒤따른다. Multicast data is transmitted first, then followed by a data transmission in a data channel for the traffic channel in the same period and the next period. 긴 브로드캐스트/멀티캐스트가 컨트롤 채널에서 수행되기 때문에, 멀티캐스트/브로드캐스트 전송이 완료된 후 까지, 남은 노드들은 데이터 채널들을 예약할 수 없다. Since long broadcast / multicast is performed on the control channel, until after the multicast / broadcast transmission is completed, the remaining nodes can not reserve data channel. 도 13은 긴 멀티캐스트가 BW를 이용과 함께 트래픽 채널에서 전송되는 단일-라디오 노드들을 가진 네트워크에 대한 타이밍도를 도시한 것이다. 13 is a single long multicast is transmitted in a traffic channel with the use of BW - shows a timing diagram for a network with the radio node. 그 밖의 유니캐스트 전송들은 컨트롤 채널 및 트래픽 채널들에서 발생한다. Other unicast transmission may occur in the control channel and traffic channel. 도 14는 긴 멀티캐스트가 BW를 이용과 함께 트래픽 채널에서 전송되는 단일-라디오 노드들을 가진 네트워크에 대한 타이밍도를 도시한 것이다. 14 is a single long multicast is transmitted in a traffic channel with the use of BW - shows a timing diagram for a network with the radio node. 멀티캐스트 데이터가 먼저 전송되고, 그 후 동일한 주기에서의 컨트롤 채널 및 데이터 채널들 및 다음 주기들 동안의 컨트롤 채널 및 데이터 채널들에서의 데이터 전송이 뒤따른다. Multicast data is transmitted first, then followed by a data transmission in the control channel and a data channel for the control channel and data channel in the same period and during the following cycle. 멀티캐스트 데이터가 특정 트래픽 채널에서 전송되는 동안 데이터 전송은 다른 채널에서 발생할 수 있다. While multicast data is transmitted on a specific traffic channel data transfer can occur in other channels. 도 15는 긴 브로드캐스트가 BW를 이용과 함께 트래픽 채널에서 전송되는 단일-라디오 노드들을 가진 네트워크에 대한 타이밍도를 도시한 것이다. 15 is a single long broadcast is transmitted in a traffic channel with the use of BW - shows a timing diagram for a network with the radio node. 브로드캐스트 데이터가 먼저 전송되고, 그 후 다음 주기들 동안 컨트롤 채널 및 데이터 채널들에서 데이터 전송이 뒤따른다. Broadcast data is transmitted first, then followed by the data transmitted in the next cycle for the control channel and a data channel. 유니캐스트 데이터에 대해, 마지막 MTBTT 이후로 또 다른 전송을 위한 라디오가 리턴되지 않으면, 노드들은 예약을 전해 받을 것으로 기대된다. If for unicast data, the radio will not return for another transmission since the last MTBTT, nodes are expected to be delivered on the reservation. 유니캐스트 데이터의 예약은 컨트롤 채널에서 CC-RTS/CC-CTS로 이루어진다. Reservations for unicast data is carried from the control channel to the CC-RTS / CC-CTS. 단일-라디오 노드들에 대한 확인 응답들은 트래픽 채널 또는 컨트롤 채널(CC-ACK) 중 하나에서 발생하며, 멀티-라디오 노드들에 대한 확인 응답들은 컨트롤 채널(CC-ACK)에서 발생한다. Single-acknowledgment of the radio nodes occurs in one of the traffic channel or a control channel (CC-ACK), a multi-acknowledgment of the radio nodes occurs in the control channel (CC-ACK). 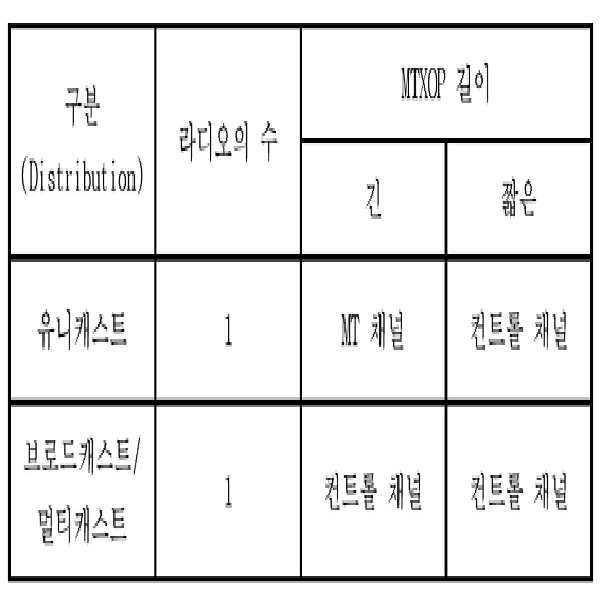 단일-라디오 노드들을 가진 네트워크에 대해, 주기당 하나의 브로드캐스트/멀티캐스트 MTXOP가 수행된다. For a single-node network with the radio, one of the broadcast / multicast MTXOP are performed per cycle. MTBTT 후의 제1 MTBTT가 브로드캐스트/멀티캐스트 데이터에 대한 것이기 때문에, 모든 노드들은 예약을 전해 받는다. Since the 1 MTBTT after MTBTT the will of the broadcast / multicast data, all the nodes are given deliver the booking. 예약 요청은 그룹에 어드레스된 CC-RTS로 달성되며, CC-CTS 응답은 요구되지 않는다. Reservation requests are achieved with a CC-RTS to the group address, CC-CTS response is required. 목적지 어드레스는 노드들(멀티캐스트) 또는 네트워크와 관련된 모든 노드들(브로드캐스트)의 그룹 중 하나를 가리킨다. The destination address points to one of a group of all nodes associated with nodes (multicast) or the network (broadcast). 확인 응답을 요하지는 않는다. It does not require an acknowledgment. BW는 MT 채널들에 대한 예약들이 컨트롤 채널에서만 허용되는 창(window)(시간 주기)이다. BW is a window (window) (period of time) are only permitted in the control channel is reserved for the MT channel. 컨트롤 채널에서의 데이터 전송은 BW 밖으로 제한된다. Data transmission on the control channel is limited out of the BW. MT 채널에서 브로드캐스트/멀티캐스트에 연루된 노드들은 다음 MTBTT 후까지 MT 채널들의 사용이 허용되지 않는다. Nodes involved in the broadcast / multicast channels in MT are not allowed to use channels of MT until after the next MTBTT. 그러한 노드들은 컨트롤 채널에 액세스할 수 있지만, 단지 BW 밖으로 제한된다. Such nodes can access the control channel, but is only limited out of BW. 채널에 대한 그들의 액세스를 증가시키기 위해, 그러한 노드들은 그들이 브로드캐스트/멀티캐스트에 연루된 주기 동안 BW를 무시할 수 있다. In order to increase their access to the channel, such nodes can ignore the BW period while they were involved in the broadcast / multicast. 표 2는 데이터 유형, 노드들에서의 라디오들의 수, 및 데이터 전송의 길이에 따른 데이터 전송에 사용하기 위한 선호 채널을 도시한 것이다. Table 2 illustrates the preferred channel for use in data transfer according to the length of the number of data types, in the radio nodes, and data transfer. 혼합된 네트워크는 단일-라디오 노드들 및 다중-라디오 노드들을 모두 포함한다. Including all the radio nodes mixed network is a single-node and multi-radio. 노드들은 컨트롤 채널 또는 공유된(shared) MT 채널(단일-라디오 및 멀티-라디오 노드들 모두에 의해 액세스 가능한 채널들)에서의 브로드캐스트/멀티캐스트 데이터일 수 있다. The nodes of the control channel or a shared (shared) MT channel may be a broadcast / multicast data in the (single-channel access by both the available radio node radio and multi). 모든 노드들은 MTBTT에서 컨트롤 채널을 릴리즈한다. All nodes must release the control channel in MTBTT. MTBTT에서, 노드들은 공통 컨트롤 채널의 NAV를 0으로 리셋한다. In MTBTT, nodes resets the NAV of the common control channel to zero. 모든 노드들은 MTBTT에서 임의의 공유된 MT채널들을 릴리즈한다. All nodes must release any of the shared channel in the MT MTBTT. 모든 단일-라디오 노드들은 MTBTT에서 모든 MT채널들을 릴리즈한다. All single-radio nodes should release all the channels in MT MTBTT. MTBTT에서, 단일-라디오 노드들은 릴리즈된 MT 채널들의 NAV들을 CS로 리셋한다. In MTBTT, single-radio nodes should reset the NAV of the channel to release MT CS. 단일-라디오 노드는 MTBTT를 곧 뒤따르는 BW 창 동안, 데이터 트래픽을 포함하는 MTXOP를 컨트롤 채널에서 전송하지 않을 것이다. Single-radio nodes will not transmit for BW window, followed by the MTBTT soon, the MTXOP containing the data traffic on the control channel. 모든 노드들은 브로드캐스트/멀티캐스트 예약을 들을 수 있다. Every node can listen to the broadcast / multicast schedule. 브로드캐스트/멀티캐스트에 대한 예약은 MT 채널들에 대한 임의의 단일-라디오 예약들 전에, 이루어질 것이다. Broadcast / multicast is scheduled for any single channel for MT - will take place before the scheduled radio. 브로드캐스트/멀티캐스트가 컨트롤 채널에서 전송될 때, 다중-라디오 노드들은 임의의 시간에 MT 채널들을 예약할 수 있고, 단일-라디오 노드들은 브로드캐스트/멀티캐스트 종료(end)들 후에 MT 채널들을 예약할 수 있다. When the broadcast / multicast is being sent on the control channel, multi-radio nodes can reserve the MT channel at any one time, single-radio nodes booking MT channel after the broadcast / multicast termination (end) can do. 공유된 MT 채널에서 브로드캐스트/멀티캐스트를 전송하기 위해, 모든 노드들은 하나의 MT 라디오가 이용가능해야 한다. To send a broadcast / multicast channels on a shared MT, all nodes are one of the MT radio should be available. 단일-라디오 노드는 브로드캐스트/멀티캐스트 예약 시에 전송하지 않는다. Single-radio node does not transmit during the broadcast / multicast schedule. 다중-라디오 노드는 다음 중 하나를 할 수 있다: 만약 다중-라디오 노드의 모든 MT 라디오들이 비지(busy)하다면, 하나의 MT 라디오에서의 전송은 MTBTT에 의해 완료되어야 하고, 또는 노드에 관련하는 브로드캐스트/멀티캐스트 예약이 이루어질 때 다중-라디오 노드의 하나의 MT 라디오에서의 MTXOP가 인터럽트된다. The multi-radio node can be one of the following: If a multi - If all MT radio radio nodes are busy (busy), transmitted from one MT radio and should be completed by the MTBTT, or broadcast associated with the node / multicast reservation is made when a multi-MTXOP is in one of the radio nodes MT radio is interrupted. 예약에 뒤따라서, 브로드캐스트/멀티캐스트에 연루된 노드들은 라디오를 선택된 MT 채널로 튜닝한다. Nodes involved in the rear Therefore, broadcast / multicast to the reservation must tune to the radio channel in the selected MT. 다중-라디오 노드들은 임의의 시간에 MT 채널들을 예약할 수 있다. The multi-radio nodes can reserve the MT channel at any time. 멀티캐스트에 연루되지 않은 단일-라디오 노드들은 멀티캐스트 종료들 후에 MT 채널들을 예약할 수 있다. A single non-involvement in the multi-cast-radio nodes may be scheduled after the MT-channel multicast ended. 멀티캐스트에 연루된 단일-라디오 노드들은 다음 MTBTT 전에는 MT 채널들을 예약할 수 없다. One involved in the multicast-radio nodes can not be scheduled until the following channels MT MTBTT. 표 3은 데이터의 유형, 노드들에서의 라디오들의 수, 및 데이터 전송의 길이에 따른 데이터 전송을 위해 사용되는 선호 채널을 도시한 것이다. Table 3 illustrates the preferred channel used for data transmission in accordance with the length of the type of data, the number of radios at the nodes, and data transfer. 현재 설명되는 방법들의 구체적인 실시예들의 흐름도는 도 16 내지 도 19에 도시되어 있다. Flow diagram of a particular embodiment of the method is now described is shown in Fig. 16 to Fig. 사각형 구성들은 여기서, "처리 블록들(processing blocks)"을 나타내고, 컴퓨터 소프트웨어 명령어들 또는 명령어들의 그룹들을 나타낸다. Rectangular configurations where represents "the processing block (processing blocks)", represent groups of computer software instructions or commands. 대안적으로, 처리 블록들은 예컨대, 디지털 신호 프로세서 회로 또는 주문형 반도체(application specific integrated circuit; ASIC)와 같은 기능적으로 균등한 회로들에 의해 수행되는 공정들을 나타낸다. Alternatively, the processing blocks may, for example, a digital signal processor circuit or an application specific integrated circuit; illustrates the process performed by functionally equivalent circuits such as a (application specific integrated circuit ASIC). 흐름도는 임의의 특정 프로그래밍 언어의 구성을 도시하지 않는다. The flow does not show any of the configuration of a particular programming language. 차라리, 흐름도들은 본 발명에 따라 요구되는 처리를 수행하기 위해, 당업자가 회로들을 제작하거나 컴퓨터 소프트웨어 프로그램을 생성하기 위해 요구하는 기능적 정보를 도시하고 있다. Rather, a flow chart, are to perform the processing required in accordance with the present invention, showing the functional information one of ordinary skill in the art requires to fabricate circuits or to generate computer software program. 예컨대, 루프들 및 변수들의 초기화 및 일시적 변수들의 사용과 같은, 많은 루틴 프로그램 구성들이 도시되어 있음을 주의해야 한다. For example, such as initiator and the use of temporary variables of loops and variables, many routine program configurations should be noted is shown. 비록 여기서 별도로 나타내지 않았더라도, 전술한 공정들의 상세 시퀀스는 단지 예시일 뿐이며, 본 발명의 정신을 벗어나지 않고 변경될 수 있음은 당업자에게 충분히 이해될 것이다. Even where even if they did not show separately, in detail the sequence of the process described above is merely exemplary, and is subject to change without departing from the spirit of the present invention it will be sufficiently understood by those skilled in the art. 따라서, 별도로 언급하지 않더라도 후술되 는 공정들은 순서적 의미가 없으며, 가능하다면, 공정들은 임의의 편의 또는 원하는 순서로 수행될 수 있다. Accordingly, even if not stated otherwise below are the processes are not the ordinal meaning, if possible, the process may be performed in any desired order or convenience of the. 도 16을 참조하면, 복수의 다중-라디오 노드들을 포함하는 무선 네트워크에서 브로드캐스트/멀티캐스트 데이터를 전송하는 방법 200을 도시한 것으로, 여기서 무선 네트워크는 컨트롤 채널 및 적어도 하나의 데이터 채널을 가진다. Referring to Figure 16, a plurality of multi-that illustrates a method for transmitting broadcast / multicast data in a wireless network including a radio node 200, where the wireless network has a control channel and at least one data channel. 본 방법은 각 다중-라디오 노드들의 하나의 라디오를 컨트롤 채널로 튜닝하는 것을 나타내는 처리 블록 202에서 시작한다. Begins at process block 202 indicates that for tuning a radio to the control node of the radio channel, the method each multiple. 처리 블록 204은 컨트롤 채널에서 브로드캐스트/멀티캐스트 데이터를 전송하는 것을 언급한다. Processing block 204 refers to the transfer of a broadcast / multicast data on the control channel. 처리 블록 206은 브로드캐스트 데이터가 무선 네트워크의 모든 노드들에 전송되고, 여기서 멀티캐스트 데이터가 무선 네트워크의 복수의 노드들에 전송되는 것을 기술하고 있다. Processing block 206 is a broadcast data is transmitted to all the nodes in the wireless network, where technology and the multicast data is transmitted on a plurality of nodes of the wireless network. 도 17을 참조하면, 복수의 라디오-노드들을 포함하는 무선 네트워크에서 브로드캐스트/멀티캐스트 데이터를 전송하는 방법 200이 도시되어 있으며, 여기서 무선 네트워크는 컨트롤 채널 및 적어도 하나의 데이터 채널을 갖는다. Referring to Figure 17, a plurality of radio-and a method for the wireless network including a node sends a broadcast / multicast data 200 is shown, where the wireless network has a control channel and at least one data channel. 본 방법은 각 다중-라디오 노드들의 하나의 라디오를 컨트롤 채널로 튜닝하는 것을 나타내는 처리 블록 202에서 시작한다. Begins at process block 202 indicates that for tuning a radio to the control node of the radio channel, the method each multiple. 처리 블록 214은 브로드캐스트/멀티캐스트 데이터 전송을 위한 채널을 선택하는 것을 기술하고 있다. Processing block 214 has technique to select the channel for the broadcast / multicast data transfer. 이것은 처리 블록 216에서 열거된 바와 같이, 브로드캐스트/멀티캐스트의 길이에 기초하여 채널을 선택하며, 여기서 짧은 길이를 가진 브로드캐스트/멀티캐스트 데이터가 컨트롤 채널에 브로드캐스트되고, 긴 길이를 가진 브로드캐스트/멀티캐스트 데이터는 컨트롤 채널 및 데이터 채널 중 어느 하나로 브로드캐스트된다. This, as recited in processing block 216, broadcast / by multicast based on the length and select a channel, wherein the broadcast / multicast data having a short length is broadcast on the control channel, the broadcast having a length / multicast data is broadcast any of the control channels and data channels together. 처리는 처리 블록 218으로 계속되며, 이것은 선택된 채널에 브로드캐스트/멀티캐스트 데이터를 전송하는 것을 나타낸다. Processing continues to process block 218, which indicates the transfer of a broadcast / multicast data to the selected channel. 처리 블록 220은 브로드캐스트/멀티캐스트 데이터 전송을 위한 데이터 채널에 관한 예약을 전해 들은 노드가 데이터 라디오를 선택된 데이터 채널로 튜닝하는 것을 언급하고 있다. Processing block 220 has an electrolyte are nodes on the reservation of the data channel for the broadcast / multicast data transmission referred to the tuning data to the selected radio channel data. 처리 블록 222은 유니캐스트 데이터의 프레임들의 예약보다 예약을 위한 프레임들의 컨트롤 채널에서의 전송에 더 높은 우선순위를 할당하는 것을 기술하고 있다. Processing block 222 has technique to assign a higher priority to the transmission on the control channel of the frames for the reservation the reservation of the frames of unicast data. 도 18a 및 도 18b를 참조하면, 복수의 단일-라디오 노드들을 포함하는 무선 네트워크에서 브로드캐스트/멀티캐스트 데이터를 제공하는 방법 250의 상세 실시예가 도시되어 있으며, 여기서 무선 네트워크는 컨트롤 채널 및 적어도 하나의 데이터 채널을 갖는다. When FIG. 18a and FIG 18b, a plurality of single-example of a method for providing a broadcast / multicast data in a wireless network including a radio node 250 detailed embodiment is shown, where the wireless network is a control channel and at least one It has a data channel. 처리는 처리 블록 252에서 시작하며, 이것은 네트워크의 모든 노드들에 의해, 미리 정해진 시간 동안 주기의 시작에서 단일-라디오 노드들에 의해 액세스 가능한 컨트롤 채널 및 데이터 채널들을 릴리즈하는 것을 나타내고 있다. The process begins at processing block 252, and this is by all nodes in the network, one at the beginning of the cycle for the predetermined time denotes to release the available control channel and a data channel access by the radio node. 처리 블록 254은 네트워크의 모든 노드들에 의해, 미리 정해진 시간 동안 주기의 시작에서 컨트롤 채널에 튜닝하는 것을 언급하고 있다. Processing block 254 are referred to by all the nodes in the network, tuning to the control channel at the beginning of the cycle for the predetermined time. 처리 블록 256이 이에 뒤따르며, 처리 블록 256은 단일-라디오 노드들에 의해 액세스 가능한 모든 데이터 채널들을 위한 채널(NAV)에 대한 타이머를 미리 정해진 시간에 시작하는 상수 값(CS)으로 세팅하는 것을 기술하고 있다. The processing block 256 follows after this, the processing block 256 is a single-technology to set to a constant value (CS) to start a timer with a predetermined time for the channel (NAV) for all possible data channel access by the radio node and. 처리 블록 258은 컨트롤 채널에 대한 타 이머(NAV)를 미리 정해진 시간에 0으로 세팅하는 것을 나타내고 있다. Processing block 258 indicates that the set to zero on the timer (NAV) for the control channel a predetermined time. 처리는 처리 블록 260으로 이어지며, 이것은 주기의 시작에서 컨트롤 채널에서 브로드캐스트/멀티캐스트 데이터에 대한 예약들 후에, 유니캐스트 데이터에 관한 예약들을 전송하는 것을 나타내고 있다. The process leads to a process block 260, this indicates that the transmit reservation on the reservation of the later, unicast data for the broadcast / multicast data on the control channel at the beginning of the cycle. 처리 블록 262은 브로드캐스트/멀티캐스트 전송들에 더 높은 액세스 우선순위를 할당하는 것을 나타내고 있고, 따라서 유니캐스트 데이터가 주기 P의 시작에서 컨트롤 채널에서 전송될 수 있기 전에 브로드캐스트/멀티캐스트 데이터를 전송하게 된다. Processing block 262 is broadcast / multicast and represents the assignment of a higher access priority to the multicast transmission, and therefore the broadcast / multicast transmission data before the unicast data to be transmitted on the control channel at the beginning of the period P It is. 처리 블록 264은 브로드캐스트/멀티캐스트 예약들에 더 높은 액세스 우선순위를 할당하는 것을 나타내고 있고, 따라서 유니캐스트 데이터가 주기 P의 시작에서 컨트롤 채널에서 전송될 수 있기 전에 브로드캐스트/멀티캐스트 예약들을 전송하게 된다. Processing block 264 is broadcast / multicast and represents the assignment of a higher access priority to the reservation, therefore, unicast data is transmitted the broadcast / multicast reservation before it can be transmitted on the control channel at the beginning of the period P It is. 처리 블록 266은 적어도 하나의 단일-라디오 노드를 포함하는 복수의 노드들을 나타내고 있으며, 여기서 단일-라디오 노드들은 브로드캐스트/멀티캐스트 전송이 완료된 후 데이터 채널들을 예약할 수 있다. Processing block 266 is at least one single-and represents a plurality of nodes including a node radio, wherein the single-radio nodes may be scheduled data channel after the completion of the broadcast / multicast transmission. 처리 블록 268은 적어도 하나의 다중-라디오 노드를 포함하는 복수의 노드들을 나타내고 있으며, 여기서 다중-라디오 노드는 임의의 시간에 데이터 채널을 예약할 수 있다. Processing block 268 is at least one multi-and represents a plurality of nodes including a node radio, wherein the multi-radio node may schedule a data channel at any time. 처리 블록 270은 상기 주기의 시작을 뒤따르는 시간 주기(BW) 동안 컨트롤 채널에서의 유니캐스트 데이터 트래픽의 전송을 막는 노드를 나타내고 있으며, 이에 따라 유니캐스트 데이터가 주기 P의 시작에서 컨트롤 채널에서 전송될 수 있기 전에 데이터 채널들에 대한 예약들이 컨트롤 채널에서 전송되도록 해준다. Processing block 270 may indicate the node to prevent the transmission of the unicast data traffic on the control channel for a period of time (BW) following the start of the cycle, so that unicast data is transmitted on the control channel at the beginning of the period P before it can be scheduled to be transmitted in the control channel it allows for the data channel. 처리 블록 272에 도시된 바와 같이, 브로드캐스트/멀티캐스트 데이터를 전송하는 것은 컨트롤 채널 및 데이터 채널 중 하나에 브로드캐스트/멀티캐스트 데이터를 전송하는 것을 포함한다. It is, as illustrated in process block 272, transmits the broadcast / multicast data comprises one of the control channel and a data channel transmitting the broadcast / multicast data. 처리 블록 274은 주기의 시작에 뒤따르는 시간 주기(BW) 동안 컨트롤 채널에서 데이터 트래픽을 전송하는 것을 막는 노드를 나타내고 있다. Processing block 274 indicates the node that prevents transmission of data traffic on the control channel for a period of time (BW) following the start of the cycle. 처리 블록 276은 전송될 멀티캐스트/브로드캐스트 데이터가 존재하지 않는 경우를 언급하고 있으며, 그때는 CS가 만료된 후에 시작되는 데이터 트래픽 전송을 위한 예약들을 허용한다. Processing block 276 is referred to and, if multicast / broadcast data to be transmitted does not exist, then it allows the reservation for the transmission of data traffic to be started after the CS has expired. 도 19를 참조하면, 단일-라디오 노드들 및 다중-라디오 노드들의 혼합을 포함하는 무선 네트워크에서 브로드캐스트/멀티캐스트 데이터를 제공하는 방법 300의 상세 실시예를 도시하고 있으며, 여기서 무선 네트워크는 컨트롤 채널 및 적어도 하나의 데이터 채널을 갖는다. Referring to Figure 19, a single-radio nodes and multiple-which illustrates a method of providing a broadcast / multicast data in a wireless network that includes a mixture of the radio node 300 detailed embodiments, where the wireless network is a control channel and it has at least one data channel. 처리는 처리 블록 302에서 시작하며, 이것은 네트워크의 모든 노드들에 의해, 미리 정해진 시간 동안 주기의 시작에서 컨트롤 채널 및 적어도 하나의 데이터 채널을 릴리즈하는 것을 나타내고 있다. The process begins at processing block 302, and it represents that the release, the control channel and at least one data channel at the beginning of the cycle for the predetermined time by all nodes in the network. 처리 블록 304은 네트워크의 모든 노드들에 의해, 미리 정해진 시간 동안 주기의 시작에서 컨트롤 채널로 튜닝하는 것을 언급하고 있다. Processing block 304 are referred to by all the nodes in the network, tuning to the control channel at the beginning of the cycle for the predetermined time. 이에는 처리 블록 306이 뒤따르며, 처리 블록 306은, 단일-라디오 노드들에 의해 액세스 가능한 모든 데이터 채널들 중 채널(NAV)에 대한 타이머를, 미리 정해진 시간에서 시작하는 상수 값(CS)으로 세팅하는 것을 기술하고 있으며, 만약 세팅되는 경우 노드가 채널에서 전송되는 막는다. This will follow after the process block 306, processing block 306 is a single-setting a timer for the access channel (NAV) of all the data channels by the radio node, a constant value (CS) beginning at a predetermined time If the technique and are, if set to prevent the node is transmitting on the channel. 처리 블록 308은 만약 세팅되는 경우 노드가 채널에서 전송되는 것을 막는, 컨트롤 채널의 채널(NAV)에 대한 타이머를, 미리 정해진 시간에 0으로 세팅하는 것을 나타내고 있다. Processing block 308 indicates that the node is set to prevent the delivery of the channel, a timer for the channel (NAV) for the control channel, and to zero at a predetermined time if the if set. 처리는 처리 블록 310으로 이어지며, 이것은 주기의 시작을 뒤따르는 시간 주기(BW) 동안 컨트롤 채널에서 유니캐스트 데이터를 전송하는 것을 막는 노드를 나타내고 있다. The process leads to a process block 310, which indicates the node that keeps transmitting the unicast data on the control channel for a period of time (BW) following the start of the cycle. 처리 블록 312은 유니캐스트 데이터의 예약 프레임들보다 그러한 예약에 대한 프레임들의 컨트롤 채널에서의 전송에 더 높은 우선순위를 할당함으로써, 브로드캐스트/멀티캐스트 전송을 위한 데이터 채널을 예약하는 것을 기술하고 있다. Processing block 312 has technique to schedule a data channel for further by assigning a higher priority, the broadcast / multicast transmission for transmission on the control channel of the frame of such a reservation than reservation frame of unicast data. 이것은 그들의 라디오를 다른 채널로 튜닝하기 전에, 예약 정보가 모든 단일-라디오 노드들에 의해 수신될 수 있도록 해준다. This is before tuning their radios to another channel, the reservation information is all single - allows the radio to be received by the node. 도 20은 노드(단일-라디오 또는 다중-라디오)로서 구성된 컴퓨터 시스템(340)의 아키텍쳐들의 예를 도시한 것이다. Figure 20 shows an example of the node architecture of a computer system 340 configured as a (single-radio-radio or multi). 노드(340)는 예컨대, 퍼스널 컴퓨터, 워크스테이션, 휴대용 컴퓨팅 디바이스, 메인프레임, 서버 또는 기타 등등과 같은 컴퓨터화된 시스템의 임의의 유형이 될 수 있다. Node 340 is, for example, can be a personal computer, a workstation, any type of computerized system such as a portable computing device, mainframe, server or the like. 본 예에서, 시스템은 메모리 시스템(342), 프로세서(343), 및 통신 인터페이스(344)와 연결된 상호연결 메커니즘(341)을 포함한다. In this example, the system includes a memory system 342, a processor 343, and a communication interface 344 and the interconnect mechanism 341 is connected. 통신 인터페이스(344)는 컴퓨터 시스템(340)이 외부 디바이스들 또는 시스템들과 통신할 수 있도록 해준다. The communication interface 344 allows computer system 340 to communicate with external devices or systems. 메모리 시스템(342)은 예컨대, 전술한 바와 같이 본 발명의 실시예들의 처리 기능성을 구현하는 데이터 및/또는 논리 명령어들과 같은 소프트웨어 코드를 나타내는 애플리케이션(345-A)이 인코딩된 컴퓨터로 판독가능한 매체의 임의의 유형 (예, 메모리에 저장된 또는 디스크와 같은 또 다른 컴퓨터로 판독가능한 매체)이 될 수 있다. The memory system 342 is an application (345-A) readable medium is encoded computer representing the software code such as data and / or logic instructions to implement processing functionality of embodiments of the present invention as described above, for example, any type of may be a (for example, and other computer-readable media such as disk or stored in memory). 프로세서(343)는 상응하는 프로세스(345-B)를 생성하기 위해, 애플리케이션들(345-A)의 논리 명령어들을 시작, 동작, 실행, 해석 또는 수행하기 위해, 상호연결 메커니즘(341)을 통해 메모리 시스템(342)에 액세스할 수 있다. Processor 343 memory via the, interconnection mechanism 341 in order to start the operation, execute, interpret or performing logic instructions of the applications (345-A) to produce a corresponding process (345-B) to It may access the system 342. 즉, 프로세스(345-B)는 컴퓨터 시스템에서 프로세서(213) 내에서 또는 상에서 실행되는 애플리케이션(345-A)의 하나 이상의 일부들을 나타낸다. That is, the process (345-B) represents one or more part of the application (345-A) that runs within the processor 213 or on a computer system. 본 발명의 실시예들은 예컨대, 플로피 디스크, 하드 디스크 또는 광학 매체와 같은 컴퓨터로 판독가능한 매체 내에, 또는 펌웨어, 롬(read only memory; ROM)과 같은 메모리 유형 시스템에 인코딩된 애플리케이션들(즉, 미-실행된 또는 비-수행되는 논리 명령어들 및/또는 데이터), 본 예에서는, 메모리 시스템(212) 내(예, 램(RAM) 내에)에서의 실행 가능한 코드를 포함하는 것으로 이해될 것이다. Embodiments of the present invention, for example, in a floppy disk, a computer readable medium such as a hard disk or optical media, or firmware, ROM; s (read only memory ROM) and encoded application in a memory type system such as (i. E., US - executed or non-in logic instructions and / or data is carried out), in this embodiment, it will be understood to include executable code in a memory in the system 212 within (e.g., RAM (RAM)). 또한, 본 발명의 그 밖의 실시예들은 프로세스들로서 프로세서(213) 내에서 동작하는 애플리케이션들을 제공할 수 있는 것으로 이해될 것이다. In addition, other embodiments of the invention are to be understood as capable of providing applications operating within the processor 213 as a process. 본 예에서 도시되지 않았더라도, 당업자라면 컴퓨터 시스템이 예컨대, 운영체제와 같은 그 밖의 프로세서들 및/또는 소프트웨어 및 하드웨어 구성들을 포함할 수 있는 것으로 이해할 것이며, 이것은 본 발명의 설명의 편의를 위해 본 설명에서는 고려하지 않는다. Although not shown in the present example, one of ordinary skill in the art will understand that can comprise a computer system, for example, other processors and / or software and hardware configuration, such as the operating system, which in the present description for convenience of description of the invention not considered. BSS가 레거시 AP 및 하나 이상의 레거시 스테이션들을 포함할 때, BSS 네트워크가 CCC 프로토콜을 이용할 수 있다. When a BSS including a legacy AP and one or more legacy stations, the BSS network may take advantage of a CCC protocol. BSS는 스테이션들의 집합을 포함할 수 있고, 여기서 하나의 스테이션은 모든 다른 스테이션들과 대화할 수 있고 BSS 외부와 통신하기 위해 스테이션들에 의해 이용되는 수단이 되는 분배 서비스 시스 템(Distribution Service System; DSS)과 통신하는 AP로서 지정된다. BSS may comprise a set of stations, where one station systems all can communicate with other stations and distribution is a means used by the station for communication with the BSS external service system (Distribution Service System; DSS ) and is designated as a communication AP. BSS의 채널의 서빙(serving) 채널은 컨트롤 채널로 이용되고, 다른 채널(바람직하게는 고 작업처리 채널)은 두 스테이션들을(예, 802.11n 스테이션들) 링크하는 채널로서 이용된다. The serving (serving) channel of the BSS channel may be used as a control channel, the other channel (preferably a high operation processing channel) is used as a channel linking the two stations (e.g., station 802.11n). 대안적으로, IBSS(Independent Basic Service Set)가 이용될 수 있고, IBSS는 애드-혹(ad-hoc) 네트워크로서 서로 통신할 수 있는 스테이션들의 집합을 포함한다. Alternatively, there may be used a (Independent Basic Service Set) IBSS, the IBSS ad-hoc as (ad-hoc) networks including a set of stations which can communicate with each other. IBSS는 AP를 이용하지 않고, 통신은 피어-투-피어(peer-to-peer) 방식으로 이루어진다. IBSS without using an AP, the communication is peer-to-peer comprises a (peer-to-peer) method-to. IBSS는 스테이션들이 통신하는데 사용하는 채널을 구축했고, 이 채널은 CCC 프로토콜의 컨트롤 채널로 이용된다. IBSS had to build a channel for use in communication stations, the channel is used as a control channel of the CCC protocol. 두 개의 스테이션은 데이터 전송들을 위해 이용하기 위한 채널로 서로 신호를 보내기 위해 컨트롤 채널을 이용하여, 상이한 채널에서 서로 통신할 수 있다. Two stations using a control channel in order to send another signal to the channel to use for data transmission, it is possible to communicate with each other on the different channels. 도 21을 참조하면, CCC 프로토콜을 이용하는 다중-라디오 BSS/메시 무선 네트워크 환경(400)의 제1 예를 도시하고 있다. Referring to Figure 21, using a multi-protocol CCC - shows a first example of a radio BSS / mesh wireless network environment 400. 환경(400)은 통신 채널(420)을 통해 WiFi 폰(404)과 통신하는 것으로 도시된, 액세스 포인트(AP)(402)를 포함한다. The environment 400 includes an access point (AP) (402) shown in communication with the WiFi phone 404 via a communication channel 420. 본 예에서, 통신 채널(420)은 CCC 프로토콜에 따른 컨트롤 채널이다. In this example, the communication channel 420 is a control channel according to the CCC protocol. 스테이션들(예, WiFi 폰(404))은 컨트롤 채널(420)에서 CC-RTS/CC-CTS)를 교환함으로써, 컨트롤 채널(420)에서 시간을 예약한다. Stations (e.g., WiFi phone 404) is reserved in the control channel (420) by exchanging the CC-RTS / CC-CTS), the time on the control channel 420. AP(402)는 또한 컨트롤 채널(420)을 통해 랩탑(412)과 통신하는 것으로 도시된다. Is AP (402) is also shown in communication with laptop 412 via a control channel 420. AP(402)는 다른 스테이션들과 통신하기 위해 CCC 프로토콜을 이용하는 레거시 AP가 될 수 있다. AP (402) may be a legacy AP using the CCC protocol to communicate with other stations. 또한, sis PDA(418)의 통신을 위해 컨트롤 채널을 이용하여, 데스크탑(416)과 통신한다. Further, by using a control channel for communication sis PDA (418), in communication with the desktop 416. AP(402), WiFi폰(404) 및 ODA(418)는 하나의 라디오를 갖고, 이에 따라 예약들을 하고, 데이터를 교환하기 위해서 컨트롤 채널을 이용한다. AP (402), WiFi phone 404 and ODA (418) uses a control channel to exchange data has one of a radio, and the reservation accordingly. 또한 환경(400)에는 예컨대, DVD 플레이어(406), HDTV(408) 및 캠코더(410)와 같은 그 밖의 스테이션들이 도시되어 있다. In addition, environment 400 includes, for example, the other stations, such as a DVD player (406), HDTV (408) and a camcorder 410 are shown. 디바이스들은 두 개의 라디오를 갖고, 컨트롤 채널을 위해 하나의 라디오를 사용하고, 나머지 하나의 라디오는 제1 데이터 채널(422)을 위해 사용한다. Devices using a single radio for two has a radio control channel, and the other radio is used for the first data channel (422). DVD 플레이어(406), HDTV(408) 및 캠코더(410)는 컨트롤 채널에서 CC-RTS/CC-CTS를 교환함으로써, 제1 데이터 채널(422)에서 시간을 예약한다. DVD player (406), HDTV (408) and the camcorder 410 may schedule a time in the exchange of CC-RTS / CC-CTS in the control channel, the first data channel (422). DVD 플레이어(406), HDTV(408) 및 캠코더(410)는 적어도 두 개의 라디오를 갖기 때문에, 하나의 라디오는 컨트롤 채널로 튜닝되고, 나머지 다른 라디오 또는 라디오들은 데이터 채널에서 데이터를 전송/수신한다. Since the DVD player (406), HDTV (408) and a camcorder (410) has at least two radios, one radio is tuned to a control channel, and the other radio or radios are transmitting / receiving data in a data channel. 디바이스는 더 높은 노드 작업처리를 위해 다수의 데이터 라디오들을 가질 수 있다. Device can have a plurality of data radio to a higher node processing operations. 컨트롤 채널은 다양한 PHY들(11a/g/n)의 데이터 채널들로서 역할할 수 있다. The control channel may serve as a data channel of the various PHY (11a / g / n). 또한, 둘 이상의 라디오를 가진 프린터(414)가 도시되어 있으며, 이것은 제2 데이터 채널(424)을 통해 랩탑(412) 및/또는 데스크탑(416)과 통신할 수 있다. Also, it is shown is a printer 414 that has more than one radio, and it is possible to communicate with a laptop over a second data channel 424, 412 and / or the desktop 416. 도 22를 참조하면, CCC 프로토콜을 이용하는 다중-라디오 BSS/메시 무선 네트워크 환경(450)의 제2 예를 도시하고 있다. Referring to Figure 22, using a multi-protocol CCC - shows a second example of the radio BSS / mesh wireless network environment (450). 환경(450)은 액세스 포인트(AP)(452)를 포함하며, 이는 통신 채널(480)을 통해 WiFi 폰(454)과 통신하는 것으로 도시되어 있다. Environment 450 includes an access point (AP) (452), which is shown in communication with the WiFi phone 454 via a communication channel (480). WiFi 폰(454)은 단일 라디오 다바이스이다. WiFi phone (454) is a single radio dabayiseu. 본 예에서, 통신 채널(480)은 CCC 프로토콜에 따른 컨트롤 채널이다. In this example, the communication channel 480 is a control channel according to the CCC protocol. 스테이션들(예, WiFi 폰(454))은 컨트롤 채널(480)에서 CC-RTS/CC-CTS를 교환함으로써, 컨트롤 채널(480)에서 시간을 예약한다. Stations (e.g., WiFi phone 454) is reserved in the control channel (480) by exchanging the CC-RTS / CC-CTS, the time on the control channel (480). 또한, PDA(Personal Digital Assistant)(468)는 단일 라디오를 갖는다. Further, PDA (Personal Digital Assistant) (468) has a single radio. PDA(468)는 컨트롤 채널(480)을 통해 데스크탑(466)과 통신한다. PDA (468) is in communication with the desktop 466 via a control channel (480). AP(452)는 다른 스테이션들과 통신하기 위해 CCC 프로토콜을 이용하는 레거시 AP가 될 수 있다. AP (452) may be a legacy AP using the CCC protocol to communicate with other stations. WiFi 폰(404) 및 PDA(418)는 하나의 라디오를 갖고, 이에 따라 예약들을 하고 데이터를 교환하기 위해 컨트롤 채널을 이용한다. WiFi phone 404 and the PDA (418) uses the control channel to have only one radios, and the reservation accordingly to exchange data. 또한 환경(450)에는 예컨대, PVR(456). In addition, environment 450 includes, for example, PVR (456). HDTV(482) 및 캠코더(460)와 같은 그 밖의 스테이션들을 도시되어 있다. There is shown the other station such as the HDTV (482) and a camcorder (460). PVR은 또한 제1 데이터 채널(482)을 통해 AP(452)와 통신한다. PVR also communicate with the AP (452) via the first data channel (482). 이 디바이스들은 두 개의 라디오를 갖고, 하나의 라디오는 컨트롤 채널을 위해, 다른 라디오는 제1 데이터 채널(482)을 위해 사용한다. The devices have two radios, one radio is for a control channel, and the other radio is used for the first data channel (482). PVR(456). PVR (456). HDTV(482) 및 캠코더(460)는 컨트롤 채널에서 CC-RTS/CC-CTS를 교환함으로써, 제1 데이터 채널(482)에서 시간을 예약한다. HDTV (482) and the camcorder 460 reservations at the time by exchanging CC-RTS / CC-CTS from the control channel and a first data channel (482). PVR(456). PVR (456). HDTV(482) 및 캠코더(460)는 적어도 두 개의 라디오를 갖기 때문에, 하나의 라디오는 컨트롤 채널로 튜닝되고, 다른 라디오 또는 라디오들은 데이터 채널에서 전송/수신한다. Because HDTV (482) and a camcorder (460) has at least two radios, one radio is tuned to a control channel and other radio or radios to receive the transmission / from the data channel. 디바이스는 더 높은 노드 작업처리를 위해 다수의 데이터 라디오들을 가질 수 있다. Device can have a plurality of data radio to a higher node processing operations. 컨트롤 채널은 다양한 PHY들(11a/g/n)의 데이터 채널들의 역할을 할 수 있다. The control channel may serve a variety of data channels of the PHY (11a / g / n). 환경(450)은 추가적으로 프린터(464)를 포함하며, 이는 둘 이상의 라디오들을 갖고, 데이터 채널(484)을 통해 랩탑(462) 및/또는 데스크탑(466)과 통신할 수 있다. Environment 450 additionally includes a printer 464, which has two or more radios, may communicate with the laptop 462 and / or the desktop 466 via a data channel (484). 데스크탑(466)은 제3 데이터 채널(486)을 통해 AP(452)와 통신할 수 있다. Desktop 466 may communicate with the AP (452) via a third data channel (486). 제3 데이터 채널(486)은 AP(452)와 통신하기 위해 멀티미디어 게임 디바이스(472)에 의해 또한 이용되며, 더 나아가 데스크탑(466)과의 통신을 위해 카메라(474)에 의해 이용된다. The third data channel 486 is used by the camera (474) for communication with the AP (452) and also is used by the multimedia game device 472 to communicate, and even the desktop 466. MP3 플레이어(476)는 데스크탑(466)과의 통신을 위해 제3 데이터 채널(486)을 이용한다. MP3 player 476 is used in the third data channel (486) for communication with the desktop 466. 이 환경에서, WiFi 폰(454) 및 PDA(468)는 단일 라디오를 갖고, AP(452)는 3개의 라디오를 갖고, 그 밖의 디바이스들은 두 개의 라디오를 갖는다. In this environment, WiFi phone 454 and a PDA (468) has a single radio, AP (452) has a third radio, and other devices have the two radio. 도 23을 참조하면, BSS/메시 무선 네트워크에서 데이터를 전송하는 방법 500의 상세 환경이 도시되어 있다. Referring to Figure 23, a detailed setting of the method of transmitting data in a BSS / mesh wireless network 500 is shown. 본 방법은 액세스 포인트(AP)를 제공하는 것을 나타내는 처리 블록 502에서 시작한다. The method begins at process block 502 indicates that for providing an access point (AP). 처리 블록 504에 도시된 바와 같이, AP는 레거시 AP를 포함한다. As shown in processing block 504, the AP includes a legacy AP. 처리 블록 506에 또한 도시된 바와 같이, AP는 적어도 두 개의 라디오를 포함한다. As also shown in process block 506, the AP includes at least two radios. 처리는 처리 블록 508으로 이어지며, 이는 복수의 스테이션들을 제공하고, 적어도 하나의 스테이션들은 AP와 통신하고, 적어도 두 개의 스테이션은 컨트롤 채널을 포함하는 무선 통신 경로를 통해 서로 직접 통신하는 것을 언급하고 있다. The process leads to a process block 508, which provides a plurality of stations, at least one station are referred to directly communicate with each other via a wireless communication path to at least two stations communicating with the AP, and includes a control channel . 직접 통신이란 용어는 두 개의 스테이션이 AP의 예약 없이 서로 대화하는 것을 설명하는데 이용된다(여기 및 이하에서). The term direct communication the two stations is used to explain that interact with each other without reservation of AP (here and hereinafter). 처리 블록 510은 레거시 스테이션을 포함하는 적어도 하나의 복수의 스테이션들을 기술한다. Processing block 510 is described at least one of the plurality of stations including a legacy station. 처리 블록 512은 복수의 스테이션들 중 적어도 하나는 적어도 하나의 라디오를 포함하는 것을 나타낸다. Processing block 512 indicates that the at least one of the plurality of stations comprises at least one radio. 처리 블록 514은 적어도 두 개의 스테이션이 공통 컨트롤 채널(CCC)을 통해 통신하는 것을 언급하고 있으며, 여기서 BSS 서빙 채널은 CCC 프로토콜을 위한 컨트롤 채널로 이용된다. Processing block 514 is at least two stations and refers to communication via a common control channel (CCC), wherein the serving BSS channel is used as a control channel for the CCC protocol. 처리 블록 516에 도시된 바와 같이, 데이터 채널은 AP 및 복수의 스테이션들을 포함하는 그룹 중 적어도 두 개에 의해 이용될 수 있다. As shown in processing block 516, a data channel may be used by at least two of the group including the AP and multiple stations. 도 24를 참조하면, IBSS(Independent Basic Service Set)/메시 무선 네트워 크에서 데이터를 전송하는 방법 550의 상세 실시예를 도시하고 있다. Referring to Figure 24, there is shown a detailed embodiment of a method of transmitting data in IBSS (Independent Basic Service Set) / mesh wireless network 550. 본 방법 550은 처리 블록 522으로 시작되며, 이는 복수의 스테이션들을 제공하며, 복수의 스테이션들 중 적어도 하나는 컨트롤 채널을 포함하는 무선 통신 경로를 통해 다른 복수의 스테이션들과 직접 통신하는 것을 나타내고 있다. The method 550 begins with processing block 522, which provides a plurality of stations, at least one of a plurality of stations indicates that over a wireless communication path that includes a control channel directly communicate with the other plurality of stations. 이것은 처리 블록 554에 도시된 바와 같이, 복수의 스테이션들 중 적어도 하나는 레거시 스테이션을 포함하는 것을 포함할 수 있다. This is at least one of the plurality of stations, as shown in process block 554 may include including a legacy station. 또한, 처리 블록 556에 도시된 바와 같이, 복수의 스테이션들 중 적어도 하나는 적어도 하나의 라디오를 포함한다. In addition, as shown in process block 556, at least one of the plurality of stations includes at least one radio. 처리는 처리 블록 558으로 이어지며, 이는 공통 컨트롤 채널(CCC) 프로토콜을 통해 복수의 스테이션들 중 적어도 하나에 의해 통신되는 것을 언급하고 있으며, 여기서 통신을 위해 IBSS에 의해 구축된 채널은 CCC 프로토콜을 위한 컨트롤 채널로서 이용된다. The process leads to a process block 558, it has been noted that the communication by means of at least one of the plurality of stations on a common control channel (CCC) protocol, wherein the channel established by the IBSS for communication is for the CCC protocol It is used as a control channel. 처리 블록 560은 데이터 채널을 이용하는 것을 나타내고 있으며, 여기서 데이터 채널은 복수의 스테이션들 중 적어도 두 개에 의해 이용된다. Processing block 560 is shown that using a data channel, wherein a data channel is used by at least two of the plurality of stations. 본 발명의 바람직한 실시예들이 설명된 것에 의해, 당업자에게는 이들 개념들을 통합하는 다른 실시예들이 이용될 수 있음이 명백하게 될 것이다. By a preferred embodiment of the present invention it has been described, those skilled in the art it will be apparent that the other embodiments may be utilized to incorporate these concepts. 또한, 본 발명의 일부로서 포함되는 소프트웨어는 컴퓨터 이용 가능한 매체를 포함하는 컴퓨터 프로그램 제품으로 구현될 수 있다. In addition, the software included as part of the present invention can be implemented in a computer program product comprising a computer usable medium. 예를 들어, 그러한 컴퓨터 이용 가능한 매체는 그에 저장되는 컴퓨터로 판독가능한 프로그램 코드 세그먼트들을 가진, 하드 드라이브 디바이스, CD-롬, DVD-롬, 또는 컴퓨터 디스켓과 같은 판독가능한 메모리 디바이스를 포함한다. For example, such a computer usable medium may include a readable memory device, such as it has readable program code segments is stored in the computer, the hard drive device, CD- ROM, DVD- ROM, or a computer diskette. 컴퓨터로 판독가능한 매체는 또한 그들에 디지털 또는 아날로그 신호들로서 기억되는 프로그램 코드 세그먼트들을 가진, 광학, 유선 또는 무 선, 통신 링크들을 포함할 수 있다. Computer-readable media may also include having program code segments stored as digital or analog signals to them, optical, wired or wireless communication link. 따라서, 본 발명은 전술한 실시예들에 한정되어서는 안되며, 첨부되는 청구항들의 정신 및 범위에만 한정되어야 한다. Accordingly, the present invention is to be limited only the spirit and scope of the claims should not be, attached to be limited to the embodiments described above. 종래 다중-라디오 채널에 대해, 각 노드는 혼잡들을 피하기 위해 채널-지정 NAV를 유지한다. For the radio channel, each node channel in order to avoid the congestion-conventional multi maintains the designated NAV. NAV는 컨트롤 또는 데이터 채널이 예약되는 시간의 길이를 추적한다. NAV tracks the length of time that the control or data channel reservation. NAV는 채널 상에서 전송되는 것이 반드시 금지되어야 하는 시간 주기(time period)이며, 노드가 예약 요청 또는 예약 요청에 대한 응답을 수신할 때 업데이트 된다. NAV is the time period (time period) that it must be prohibited to be sent on the channel, and is updated when the node receives a response to the reservation request or reservation request. 데이터 채널의 NAV는 CC-RTS/CC-CTS의 예약 지속 기간 필드의 값에 기초한다. NAV data channel is based on the value of the Reservation Duration field in the CC-RTS / CC-CTS. 데이터 채널에서 수신된 NAV-세팅 프레임들은 데이터 채널 NAV들을 또한 업데이트한다. The NAV- setting frame received from the data channel must also update the data channel NAV. 종래 단일-라디오 프로토콜에 대해, 컨트롤 채널 상에는 제공된 라디오가 없기 때문에, 컨트롤 및 데이터 채널들에 수신된 NAV 세팅 프레임들에 기초하여 NAV를 단독으로 유지하는 것은 불가능하다. Conventional single-it is not possible due to the radio protocol, it is not formed on the supplied radio control channel, based on the control, and the NAV setting frame received on the data channel to maintain NAV alone. 손실된 NAV 정보를 복원하기 위해, 모든 채널들을 주기적으로 릴리즈(release)하도록 하는 요구들이 모든 채널들의 NAV를 0으로 리셋되도록 한다. To restore the missing NAV information, it needs to periodically release (release) of all channels have to be reset the NAV of all channels to zero. 동일한 이유로, 종래 단일-라디오 및 멀티-라디오 노드들 둘 다에 의해 공유된 컨트롤 채널 및 임의의 데이터 채널들은 혼합된 네트워크에서 주기적으로 릴리즈되어야 한다. For the same reason, the conventional single-radio and multi-radio nodes, both the control channel and a data channel shared by any are to be released periodically, in a mixed network. 본 발명은 무선 네트워크에서 브로드캐스트/멀티캐스트 데이터를 효율적으로 전송하기 위한 방법 및 장치를 제공하는 메커니즘들 및 기술들을 제공한다. The present invention provides mechanisms and techniques that provide a method and apparatus for efficiently transmitting the broadcast / multicast data in a wireless network. 도 1은 유니캐스트(unicast) 트래픽을 갖는 다중-네트워크 환경을 도시한 도면. Figure 1 is a multi-unicast having a (unicast) traffic-diagram illustrating a network environment. 도 2는 컨트롤 채널에서 전송되는 짧은(short) 멀티캐스트 트래픽을 갖는 다중-네트워크 환경을 도시한 도면. Figure 2 is a multi having a short (short) multicast traffic is transmitted on the control channel, a diagram illustrating a network environment. 도 3은 컨트롤 채널에서 전송되는 긴(long) 멀티캐스트 트래픽을 갖는 다중-네트워크 환경을 도시한 도면. Figure 3 is a multi having a long (long) multicast traffic is transmitted on the control channel, a diagram illustrating a network environment. 도 4는 트래픽 채널에서 전송되는 긴 멀티캐스트 트래픽을 갖는 다중-네트워크 환경을 도시한 도면. Figure 4 is a multi having a long multicast traffic from a traffic channel - a diagram illustrating a network environment. 도 5는 트래픽 채널에서 전송되는 긴 멀티캐스트 트래픽을 갖는 다중-네트워크 환경을 도시한 도면. 5 is a multi having a long multicast traffic from a traffic channel - a diagram illustrating a network environment. 도 6은 네트워크에서 데이터 전송을 위한 다중 주기들(multiple periods)의 타이밍 도를 도시한 도면. Figure 6 is a diagram showing a timing chart of the multi-cycle (multiple periods) for data transmission on the network. 도 7은 세 개의 상이한 트래픽에 대한 타이밍 도를 도시한 도면. Figure 7 shows a timing diagram for the three different traffic. 도 8은 컨트롤 채널에서 전송되는 짧은 멀티캐스트 트래픽을 갖는 단일-네트워크 환경을 도시한 도면. Figure 8 is one having a short multicast traffic to be transmitted on the control channel, a diagram illustrating a network environment. 도 9는 트래픽 채널에서 전송되는 짧은 멀티캐스트 트래픽을 갖는 단일-네트워크 환경을 도시한 도면. 9 is one having a short multicast traffic from a traffic channel - a diagram illustrating a network environment. 도 10은 트래픽 채널에서 전송되는 짧은 멀티캐스트 트래픽을 갖는 단일-네트워크 환경을 도시한 도면. Figure 10 is one having a short multicast traffic from a traffic channel - a diagram illustrating a network environment. 도 11은 트래픽 채널에서 전송되는 짧은 멀티캐스트 트래픽을 갖는 단일-네트워크 환경을 도시한 도면. Figure 11 is one having a short multicast traffic from a traffic channel - a diagram illustrating a network environment. 도 12는 컨트롤 채널에서 전송되는 긴 멀티캐스트 트래픽을 갖는 단일-네트워크 환경을 도시한 도면. Figure 12 is one having a long multicast traffic to be transmitted on the control channel, a diagram illustrating a network environment. 도 13은 트래픽 채널에서 전송되는 긴 유니캐스트 트래픽을 갖는 단일-네트워크 환경을 도시한 도면. Figure 13 is one having a long unicast traffic is transmitted in a traffic channel - a diagram illustrating a network environment. 도 14는 트래픽 채널에서 전송되는 긴 멀티캐스트 트래픽을 갖는 단일-네트워크 환경을 도시한 도면. Figure 14 is one having a long multicast traffic from a traffic channel - a diagram illustrating a network environment. 도 15는 트래픽 채널에서 전송되는 긴 유니캐스트 트래픽을 갖는 단일-네트워크 환경을 도시한 도면. Figure 15 is one having a long unicast traffic is transmitted in a traffic channel - a diagram illustrating a network environment. 도 16은 멀티-라디오 노드들을 갖는 네트워크에서 멀티캐스트/브로드캐스트를 전송하는 방법의 제1 실시예의 흐름도를 도시한 도면. Figure 16 is a multi-view showing a first embodiment flow chart of a method for sending multicast / broadcast in a network having a radio node. 도 17은 멀티-라디오 노드들을 갖는 네트워크에서 멀티캐스트/브로드캐스트를 전송하는 방법의 제2 실시예의 흐름도를 도시한 도면. Figure 17 is a multi-view showing a second embodiment flow chart of a method for sending multicast / broadcast in a network having a radio node. 도 18a 및 도 18b는 단일-라디오 노드들을 갖는 네트워크에서 멀티캐스트/브로드캐스트를 전송하는 방법의 일 실시예의 흐름도를 도시한 도면. Figure 18a and Figure 18b is a single-view showing a flow diagram of one embodiment of a method for transmitting multicast / broadcast in a network having a radio node. 도 19는 멀티-라디오 노드들 및 단일-라디오 노드들을 갖는 네트워크에서 멀티캐스트/브로드캐스트를 전송하는 방법의 일 실시예의 흐름도를 도시한 도면. Figure 19 is a multi-radio nodes and single-radio nodes in a network having a multicast / broadcast an exemplary view showing a flowchart of a method of transmitting. 도 20은 본 발명의 실시예들에 따른 무선 네트워크에서 브로드캐스트/멀티캐스트 데이터를 전송하는 것을 수행하는 노드에 대한 컴퓨터 시스템 아키텍쳐의 일 예를 도시한 도면. 20 is a view showing an example of a computer system architecture for a node performing the transfer of broadcast / multicast data in a wireless network in accordance with embodiments of the present invention. 도 21은 컨트롤 채널 및 두 개의 데이터 채널을 이용하는 CCC MAC 하에서의 다중-채널 BSS의 블록도를 도시한 도면. 21 is a control channel and two-channel data under the multi-MAC using the CCC - shows a block diagram of the channel BSS. 도 22는 컨트롤 채널 및 세 개의 데이터 채널을 이용하는 CCC MAC 하에서의 다중-채널 BSS의 블록도를 도시한 도면. Figure 22 is a multi under CCC MAC using the control channel and three data channels - shows a block diagram of the channel BSS. 도 23은 BSS(Basic Service Set)/메시 무선 네트워크에서 데이터를 전송하는 방법의 일 상세 실시예의 흐름도를 도시한 도면. 23 is a BSS (Basic Service Set) / mesh wireless network diagram showing a detailed flow chart of an embodiment of one method of transferring data in a. 도 24는 IBSS(Independent Basic Service Set)/메시 무선 네트워크에서 데이터를 전송하는 방법의 일 상세 실시예의 흐름도를 도시한 도면. 24 is a view showing an exemplary detailed flowchart of an embodiment of a method of transmitting data in (Independent Basic Service Set) IBSS / mesh wireless network. 서로 통신하는 상기 복수의 스테이션들 중 상기 적어도 두 개는 공통 컨트롤 채널(Common Control Channel;CCC) 프로토콜로 통신하고, 상기 CCC 프로토콜을 위한 상기 컨트롤 채널로서 BSS 서빙 채널(BSS serving channel)이 이용되고, 스테이션들은 상기 컨트롤 채널에서 CC-CTS 및 CC-RTS 메시지들을 교환하여 상기 컨트롤 채널에서 시간을 예약하고, 상기 컨트롤 채널은 다양한 PHY들의 데이터 채널들로서 역할할 수 있는, BSS/메시 무선 네트워크. The at least two of said plurality of stations that communicate with each other one on the common control channel, and the BSS serving the channel (BSS serving channel) as the control channel for the CCC protocol used, and the communication protocol (Common Control Channel CCC), stations in the control channel CC-CTS and the CC-RTS to exchange messages in the schedule when the control channel and the control channel, BSS / wireless mesh network that can serve as a data channel of different PHY. 데이터 채널을 더 포함하고, 상기 데이터 채널은 상기 AP 및 상기 복수의 스테이션들을 포함하는 그룹 중 적어도 두 개에 의해 이용되는, BSS/메시 무선 네트워크. Further comprising a data channel, the data channel, BSS / mesh wireless network which is used by at least two of a group including the AP and the plurality of stations. 상기 AP는 레거시 AP(legacy AP)를 포함하는, BSS/메시 무선 네트워크. The AP, BSS / wireless mesh network including a legacy AP (legacy AP). 상기 복수의 스테이션들 중 적어도 하나는 레거시 스테이션을 포함하는, BSS/메시 무선 네트워크. At least one of the plurality of stations, BSS / mesh wireless network including a legacy station. 상기 AP는 적어도 하나의 라디오를 포함하는, BSS/메시 무선 네트워크. The AP, BSS / mesh wireless network comprising at least one radio. 상기 복수의 스테이션들 중 적어도 하나는 적어도 하나의 라디오를 포함하는, BSS/메시 무선 네트워크. At least one of the plurality of stations, BSS / mesh wireless network comprising at least one radio. 상기 복수의 스테이션들 중 상기 적어도 하나는 공통 컨트롤 채널(CCC) 프로토콜로 통신하고, 통신을 위해 상기 IBSS에 의해 구축된 채널이 상기 CCC 프로토콜을 위한 상기 컨트롤 채널로서 이용되는, IBSS/메시 무선 네트워크. Wherein at least one of the plurality of stations is a common control channel (CCC), IBSS / mesh network that uses a communication protocol, and a channel established by the IBSS for communication as the control channel for the CCC protocol. 데이터 채널을 더 포함하고, 상기 데이터 채널은 상기 복수의 스테이션들 중 적어도 두 개에 의해 이용되는, IBSS/메시 무선 네트워크. Further comprising a data channel, the data channel, IBSS / mesh wireless network which is used by at least two of the plurality of stations. 상기 복수의 스테이션들 중 적어도 하나는 레거시 스테이션을 포함하는, IBSS/메시 무선 네트워크. At least one of the plurality of stations, IBSS / mesh wireless network including a legacy station. 상기 복수의 스테이션들 중 적어도 하나는 적어도 하나의 라디오를 포함하는, IBSS/메시 무선 네트워크. At least one of the plurality of stations, IBSS / mesh wireless network comprising at least one radio. 공통 컨트롤 채널(CCC) 프로토콜로 상기 적어도 두 개의 스테이션들 간에 통신하는 단계를 포함하고, 상기 CCC 프로토콜을 위한 상기 컨트롤 채널로서 BSS 서빙 채널이 이용되는, BSS/메시 무선 네트워크에서 데이터를 전송하는 방법. Comprises the step of communicating between the at least two stations of a common control channel (CCC) protocol, and transmits the data in, BSS / mesh network that the BSS serving channel used as the control channel for the CCC protocol. 상기 AP 및 상기 복수의 스테이션들을 포함하는 그룹 중 적어도 두 개에 의해 데이터 채널을 이용하는 단계를 더 포함하는, BSS/메시 무선 네트워크에서 데이터를 전송하는 방법. To the AP, and further comprising using the data channel by at least two of the group including the plurality of stations, transmitting data from the BSS / mesh wireless network. 상기 AP는 레거시 AP를 포함하는, BSS/메시 무선 네트워크에서 데이터를 전송하는 방법. The AP is how to transfer data including a legacy AP, BSS / mesh wireless network. 상기 복수의 스테이션들 중 적어도 하나는 레거시 스테이션을 포함하는, BSS/메시 무선 네트워크에서 데이터를 전송하는 방법. At least one of the plurality of stations is a method of transmitting data in, BSS / mesh wireless network including a legacy station. 상기 AP는 적어도 하나의 라디오를 포함하는, BSS/메시 무선 네트워크에서 데이터를 전송하는 방법. The AP is how to transfer data, BSS / mesh wireless network comprising at least one radio. 상기 복수의 스테이션들 중 적어도 하나는 적어도 하나의 라디오를 포함하는, BSS/메시 무선 네트워크에서 데이터를 전송하는 방법. At least one of the plurality of stations is a method of transmitting data in, BSS / mesh wireless network comprising at least one radio. 상기 복수의 스테이션들 중 상기 적어도 하나에 의해 공통 컨트롤 채널(CCC) 프로토콜로 통신하는 단계를 포함하고, 통신을 위해 상기 IBSS에 의해 구축된 채널이 상기 CCC 프로토콜을 위한 상기 컨트롤 채널로서 이용되는, IBSS/메시 무선 네트워크에서 데이터를 전송하는 방법. Of the plurality of stations and comprising the step of communicating to a common control channel (CCC) protocol by the at least one, the channel established by the IBSS for communication is used as the control channel for the CCC protocol, IBSS a method of transmitting data from / mesh wireless network. 데이터 채널을 더 포함하고, 상기 데이터 채널은 상기 복수의 스테이션들 중 적어도 두 개에 의해 이용되는, IBSS/메시 무선 네트워크에서 데이터를 전송하는 방법. Further comprising a data channel, the data channel is a method of transmitting data in, IBSS / mesh wireless network which is used by at least two of the plurality of stations. 상기 복수의 스테이션들 중 적어도 하나는 레거시 스테이션을 포함하는, IBSS/메시 무선 네트워크에서 데이터를 전송하는 방법. At least one of the plurality of stations is a method of transmitting data in, IBSS / mesh wireless network including a legacy station. 상기 복수의 스테이션들 중 적어도 하나는 적어도 하나의 라디오를 포함하는, IBSS/메시 무선 네트워크에서 데이터를 전송하는 방법. At least one of the plurality of stations is a method of transmitting data in, IBSS / mesh wireless network comprising at least one radio.